Within academic work there has grown an increasing space for, research and interest in a vast variety of often quite fringe or leftfield cultural work. Once upon a time, not actually all that long ago (although in the decades), you could count the number of say media studies courses available at UK universities on less than the digits of one hand. Now, well, if you should wander through a university’s library, peruse their prospectuses and/or areas of expertise and research interests of their staff you are almost as likely to come across mentions of say niche cinema as for example more traditional philosophical thought. 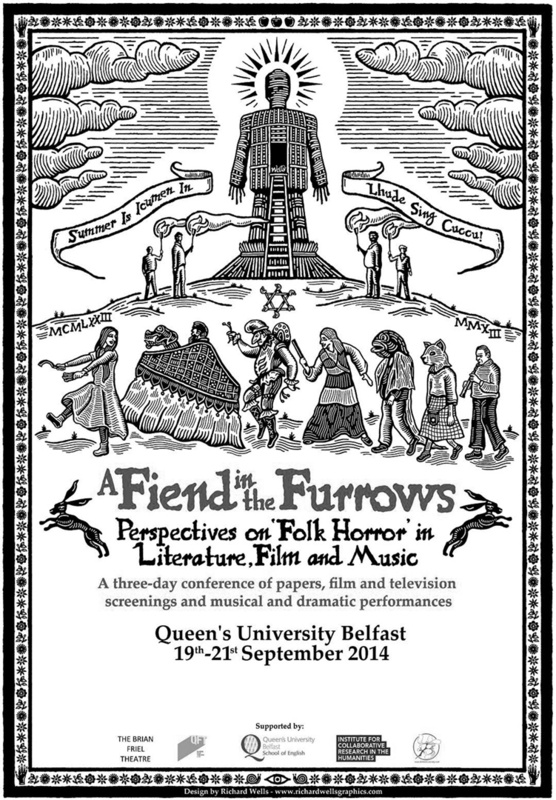 A Fiend In The Furrows was a 2014 conference on “Perspectives on Folk Horror in Literature, Film and Music”, which was held at Queen’s University in Belfast. 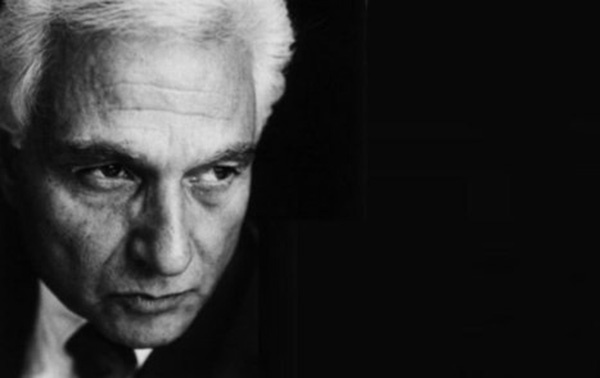 Hauntology: 20 Years On, a one-day academic symposium at the National Media Museum organised by the Communication Culture and Media Research Group which is part of the University of Bradford and which focused on the legacy of philosopher Jacques Derrida, who coined the phrase/concept hauntology. While in 2003 there was a three day academic conference on The Wicker Man called The Wicker Man: Readings Rituals and Reactions at the University of Glasgow, which lead to the production of a book which collected essays based on the papers presented at the conference called Constructing The Wicker Man published in 2005, which in turn lead to a further academic collection of essays, The Quest for the Wicker Man: Historical, Folklore and Pagan Perspectives, which featured an intertwined set of writers and editors. More recently in Glasgow in 2017 as part of the Merchant City Festival there was an event called Deconstructing The Wicker Man, which involved a screening of the film and also featured discussions by Dr Jonny Murray who was involved in the above University of Glasgow event/Wicker Man book and Dr Lizanne Henderson of the University of Glasgow. 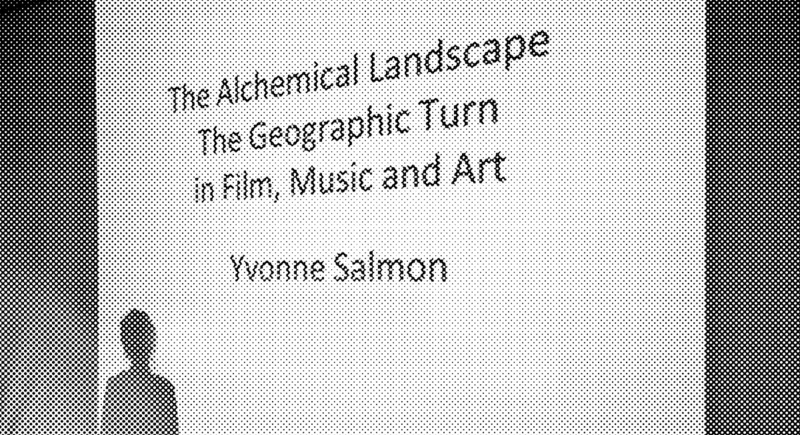 Travelling along interconnected cultural pathways, The Alchemical Landscape at the University of Cambridge is a research group which has hosted a number of ongoing events and discussions and focuses in part on “occultural” representations of rural, landscape and spectral work. 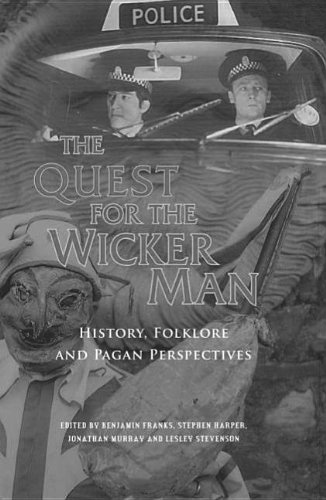 Alongside discussions of The Wicker Man at such events there have been considerations of the pastoral noir aspects of Shirley Collins’ music, folk music traditions in relation to hauntology, numerous folk horror/hauntology related presentations and screenings including the likes of Witchfinder General, The Ash Tree, The Stone Tape and other work by Nigel Kneale and so forth. 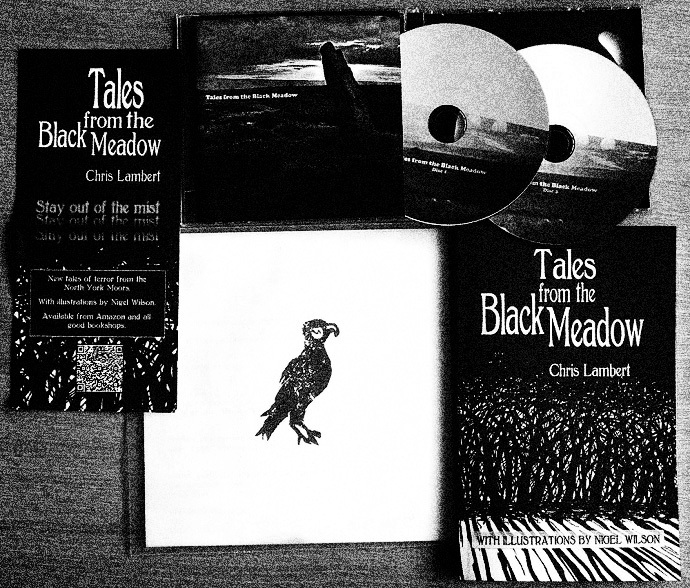 The events have also included performances, talks etc by the likes of author Chris Lambert, who has contributed to the Tales From The Black Meadow project which creates a multi-faceted fictitious otherly folkloric/hauntological world, Mark Fisher who was the author of hauntology related book Ghosts of My Life and Robin The Fog of Radiophonic-esque tape loop manipulators Howlround. 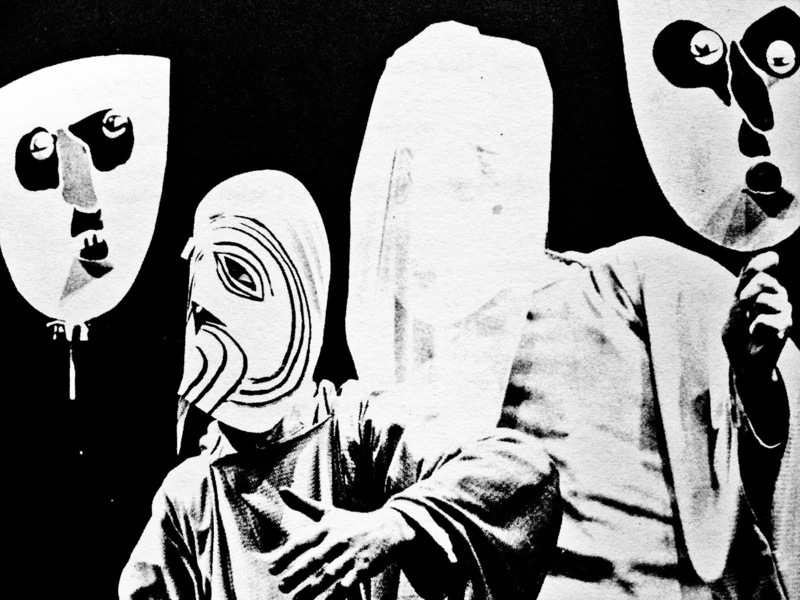 They have also included a talk by Drew Mulholland whose album The Séance at Hobs Lane, released under the name Mount Vernon Arts Lab, was inspired in part by Nigel Kneale’s Quatermass work alongside “Victorian skullduggery, outlaws, secret societies and subterranean experiences” and which was re-released by Ghost Box Records. And also Sharron Kraus, whose work seems imbued with a sense of very personal research that takes in layered tales of the land, folk music and folklore. So, we thought a nice, relaxing way to end the year would be a visit to some of the patterns to be found across the land and amongst the woods and forests. More specifically trees, leaves and bark. 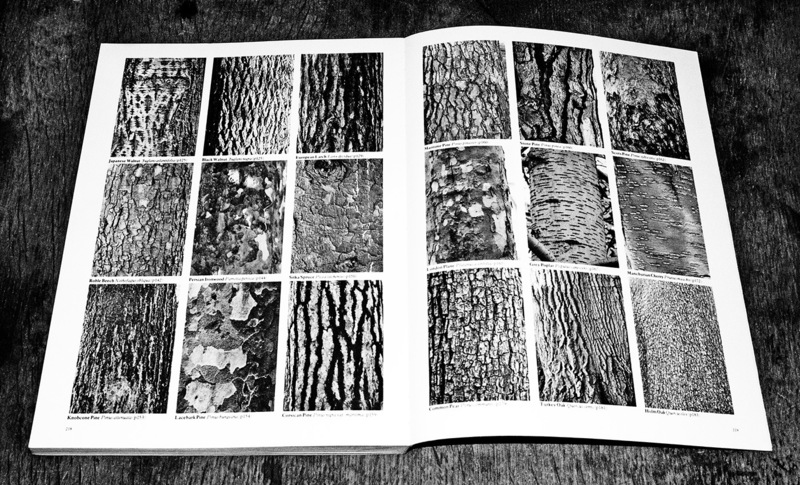 More specifically again Roger Phillips book Trees In Britain from 1978. Looking at this book, I’m not so sure if it’s calligraphy when presented like this. Maybe rather a form of natural clip art (that made me think of the Craphound zine if you should remember that). 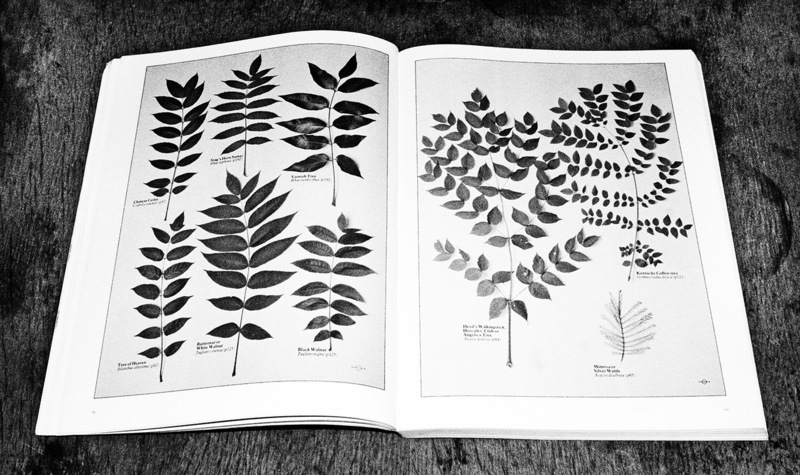 Anyways, looking such things up, I see that there are quite a few more of these arborea and related books written and researched by Mr Phillips – more than enough natural clip art to keep you busy for a fair old while. Anyways, thankyou all good sirs and ladies for the time and attention this year. Thankyou also once again to everybody who has contributed work to the series of album releases and all those who have broadcast or written about them. And indeed everybody who has dipped into their zeros and ones pockets, purses and wallets for one or more of said items. Tip of the hat to you all and here’s to a good repose and the next spin around the sun. 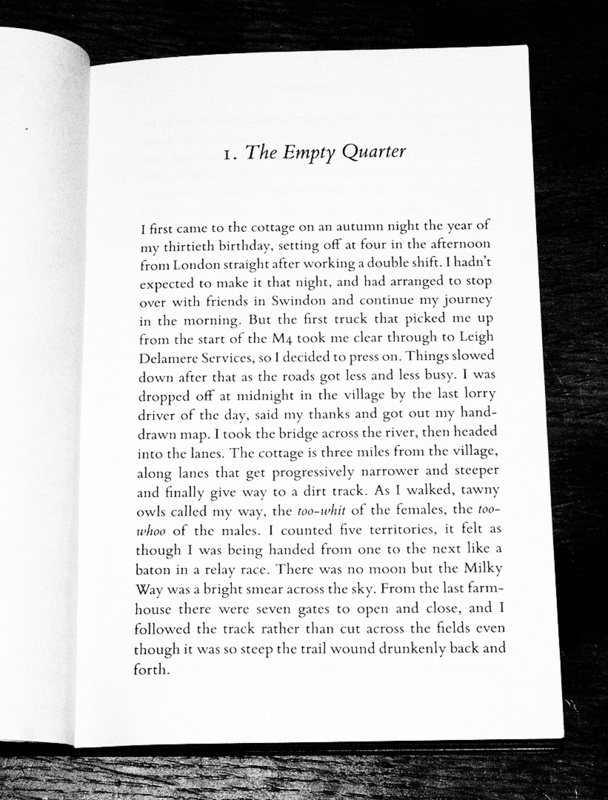 …there is a possible connection to those and the book Deep Country but also none at all – this was not a brief, managed hardship repose for the cameras but rather a very particularly ongoing way of life. That “no transport, no phone” could be extended to no gas, electricity, (I assume) internet and without running water – indeed he was above the water table and so had to physically carry his water uphill from the well. In some ways it reminded me of Ben River’s film Two Years At Sea, which focuses on the solitary life of a gent who lives in a small-ish shack amongst the wilds. However, Deep Country is more a personal journal of a life lived; whereas Two Years At Sea, although it does document an actual way of life, feels nearer to an art project directed by its creator – a recording alongside being a form of personal creative expression. 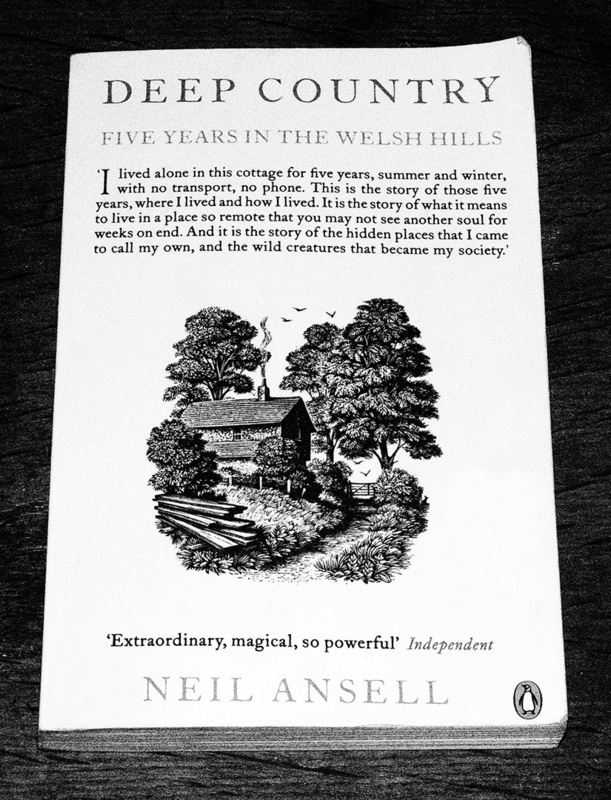 Also, while Deep Country is set remotely (in an area of Wales apparently known as its green desert or empty quarter), its author is within various degrees of walking distance to farms, a small village, a shop, a doctors; in Two Years At Sea, the place shown seems far removed geographically from any such things. It is all swings and roundabouts however; the gent in two Two Years At Sea is shown as having / using a shower, record player and motor transport (although their actuality could only be considered modern conveniences in a fairly rough and ready manner), whereas such things most definitely don’t seem to be in use during Deep Country. 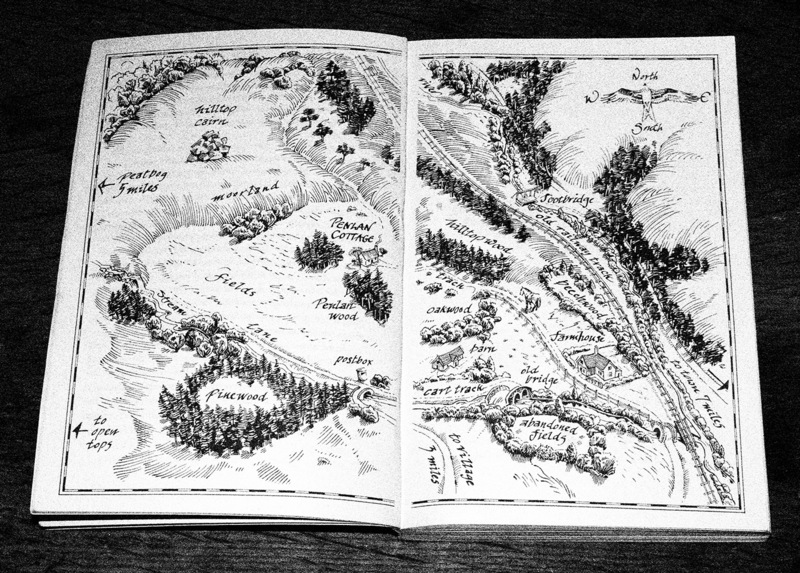 Another large difference is that Two Years At Sea, by its filmic nature, is a visual experience, whereas Deep Country is an almost exclusively text based story, apart from a woodcut-esque cover illustration of the cottage and a stylised pictorial map of the immediate surrounds of the cottage. That lack of visual presentation or documentation makes me think of how this a way of life without (I assume) any access to screens – whether television, computer, phone etc. Indeed, what seems to become Neil Ansell’s entertainment and television equivalent is observing those earlier mentioned wild creatures and in particular bird watching or seeking out; walking a whole day on the slight chance of seeing a particular nesting bird becomes a normal occurrence for him. Neil Ansell doesn’t overly dwell on why he chose to live like this for an extended length of time apart from a curiousity about do-able-ness and the practical challenge of it all; one of my abiding memories from the book was that after a while, the associated hardships and physical labour / preparations all just became day-to-day life, part of manageable and managed yearly rituals and he described himself as having “become part of the landscape, a stone”. Peruse Deep Country here. Visit Two Years At Sea around these parts here and at Ben Rivers’ home in the ether here. There are a fair number of books out in the world that focus on ancient monuments, follies, crumbling castles and so forth. And while many of them are perfectly pleasant, they’re not necessarily things I feel the need to own; there’s a certain atmosphere or other-ness that is hard to fully define which I look for, that can creep in around the edges of often fairly mainstream books. Monumental Folies is one of those books. 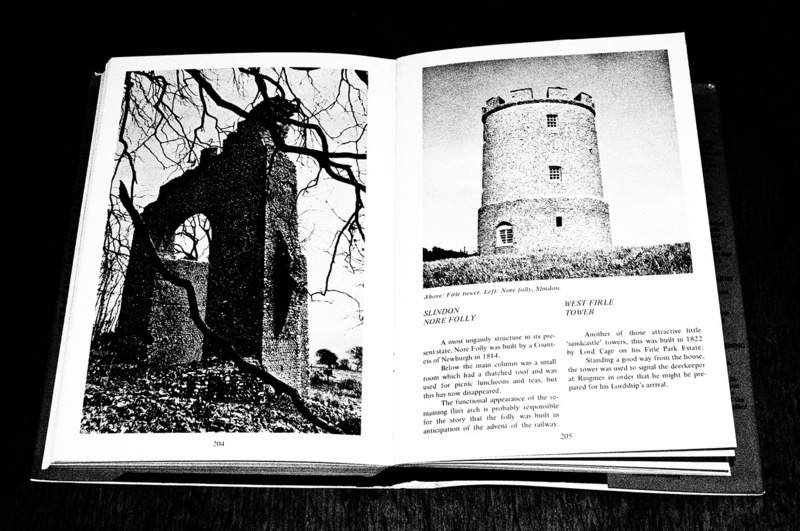 Written by Stuart Barton and published in 1972 it is a photographic/text appreciation of follies throughout Britain but seems to capture a very different atmosphere of such things than the more chocolate box heritage take on them; its a quiet, subtley off-centre difference but there nonetheless. This isn’t a book that makes you conjure up sun filled images of tourist friendly picnics (although it does still make me want to wander off and visit some of them). As far as I can tell, the photographs weren’t taken by Mr Barton – or if he did, he had a very busy year or few – but they have a consistent tone that seems far removed from those more twee views of its subject matter. 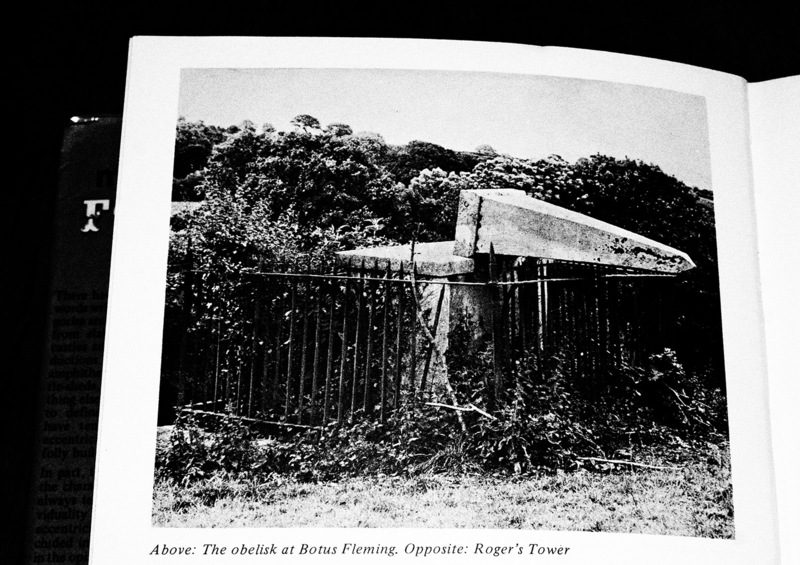 …well, it probably didn’t help that the first page I opened showed the above neglected/tumbled obelisk, which if you did an online image search for something like “worrying 1970s Public Information Films and municipal neglect around a similar time” I suspect it might well show up. Which I think reflects two strands within the book; there is a sense of it belonging to a gentler, pre-1970s time and also to the unrest of the period it was published. 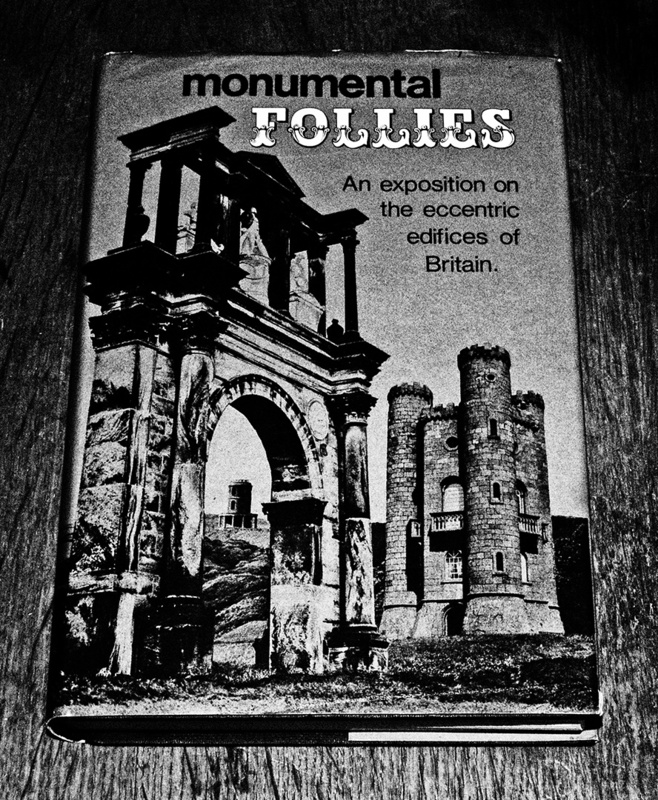 I was pointed in the direction of Monumental Follies by Mr Jason Hazeley, one of the authors of B******s To Alton Towers: Uncommonly British Days Outs, which (along with its companion book) could also be considered a quiet, subtley off-centre take on what is often presented in a more chocolate box manner. 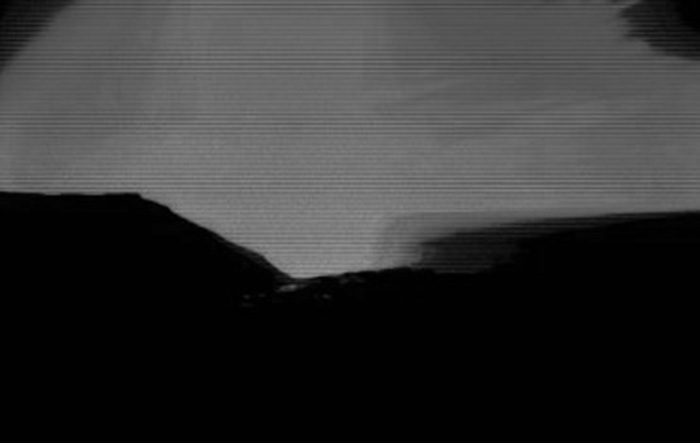 Visit those around these parts via The Following Of Ghosts and elsewhere in the ether here and here. Monumental Follies itself can generally be found for but a few pence(ish) here. Well, this was something of a find (or strictly speaking a signposted towards wander of a wander). There seems to have grown/arrived in the world a kind of romantic appreciation of brutalist architecture, edgelands, derelict spaces and industry… not necessarily things that you would immediately expect to attach the word romance to. I think in a way they have come to be imbued with a sort of hauntological melancholia, a yearning for a both real and imagined past, things and ways lost. 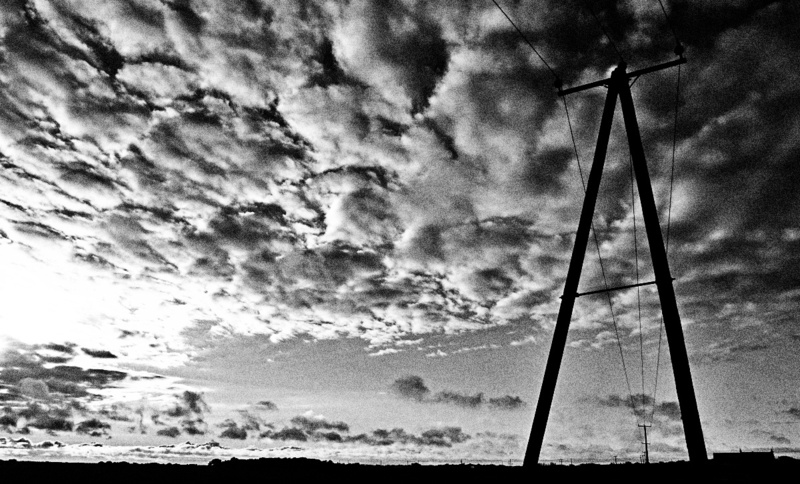 Veloelectroindustrial is a relatively new space/place in the ether that focuses on such things and it seems to be a capturing of that yearning, created with a very particular beauty and lyricism. 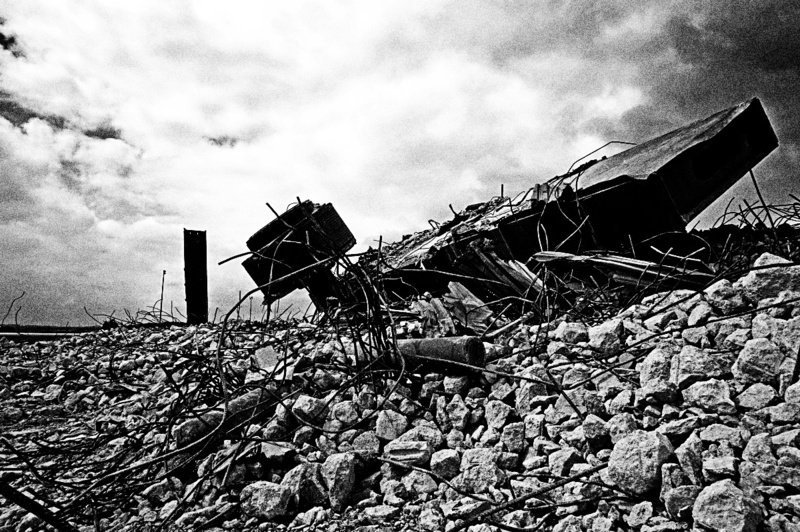 Essentially it is a blog that documents the wanderings and explorations of forgotten industry, land that is slowly being reclaimed, the tumbling and crumbling along the nation’s coastlines. Lovely stuff. 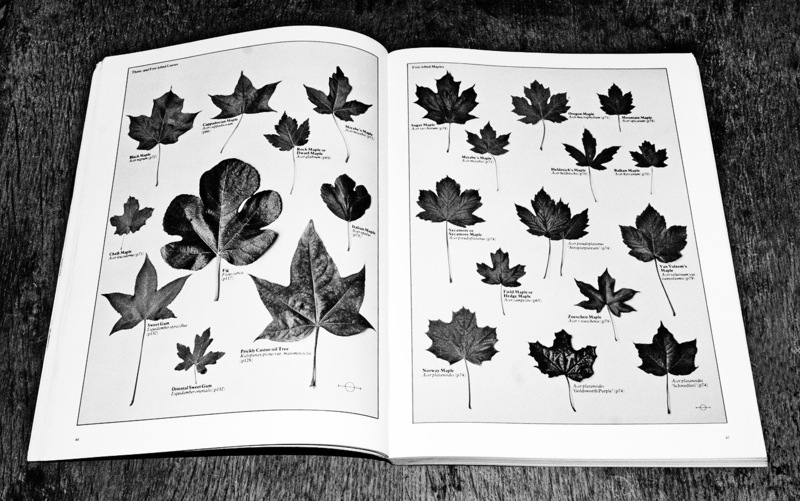 The photography has a fine, stylish and well observed take on its subject matter and brings or reflects a surprising and intriguing artistry to these essentially very utilitarian objects. 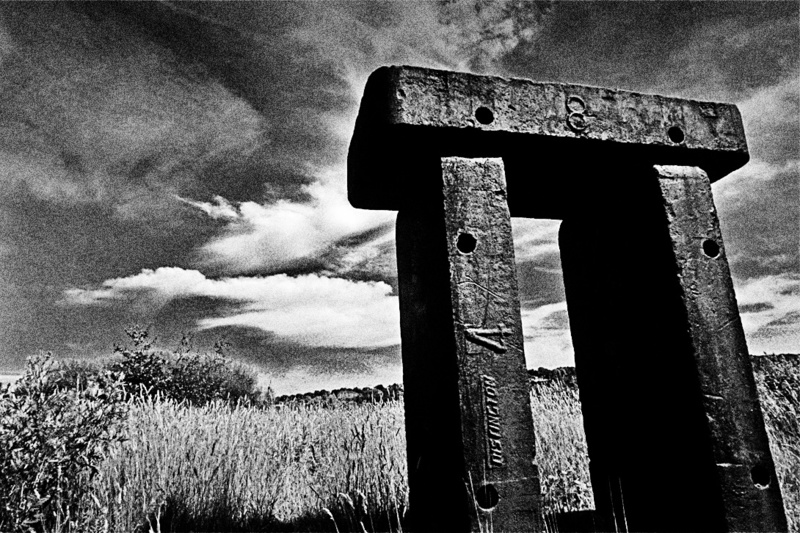 I was particularly taken by a couple of images which, although they are of more modern day industrial/communication structures, seemed to connect back to a more folkloric or ancient history of the land; echoes of wicker structures marching across the land or monuments for worship. Also, the Harworth Machine, the name and appearance of which made it seem to be something that had fallen from the skies via battles in a forgotten science fiction tale. Definitely somewhere in the ether to revisit and look forward to where its creator’s wandering take it next. I was pointed in the direction of it by Grey Frequency, whose work may well be a fine musical accompaniment to peruse the site to (alongside Veloelectroindustrial’s own choice of Steel City synth pioneers), being in part a soundtrack to or inspired by those very same edgelands and fading industrial documents of the nation’s past. Visit Grey Frequency at two of their homes in the ether here and here and around these parts via a consideration of related Cold Geometries and the encasements of the Immersion album. Previous tumblings from dsytopic tales around these parts can be found here. 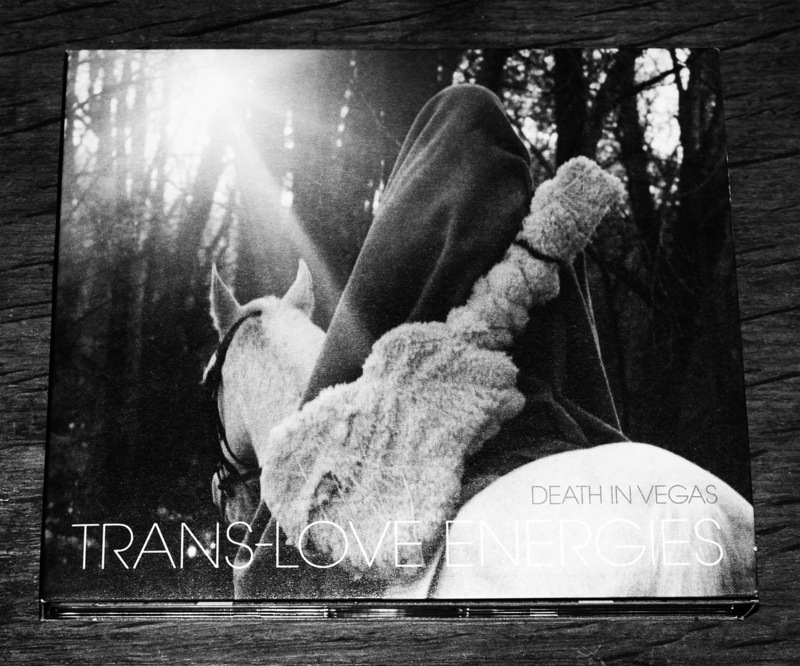 The phrase hipster is generally used as a form of jokey or mild(ish) derision but the cover to Death In Vegas Trans-Love Energies album caused me to wander if it always is an actual jibe. 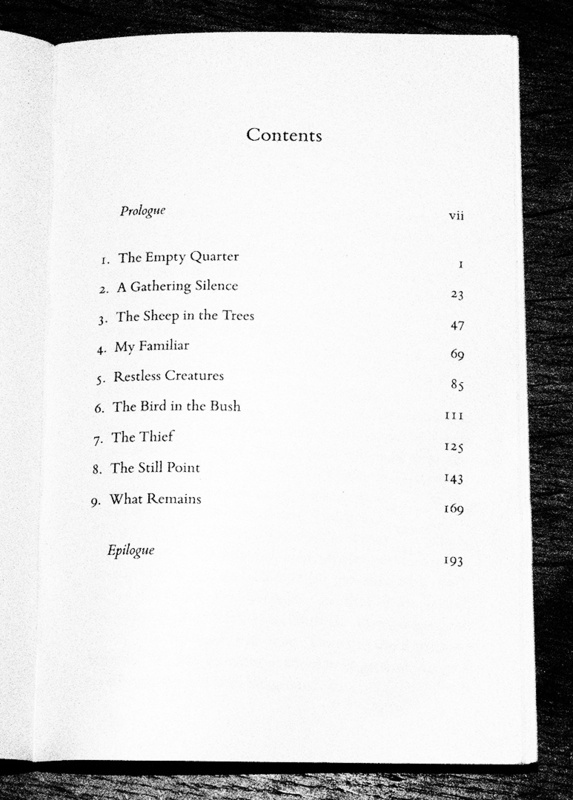 The cover made me think of a sort of otherly pastoral hipster-ism but in a good way. 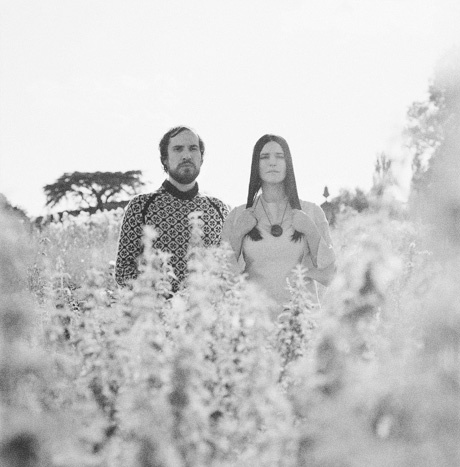 Kind of like how say Joanna Newsome, Devendara Banhart and Coco Rosie were the hipster kids of what became loosely know as freak folk (or the “popular kids” to quote Seasons They Change author Jeanette Leech). In that instance a sort of dressy, playful, artifice and experimentation that could maybe sometimes be rather sweet to the taste but that depends on your mood, inclination and indeed bent or disposition for such things. 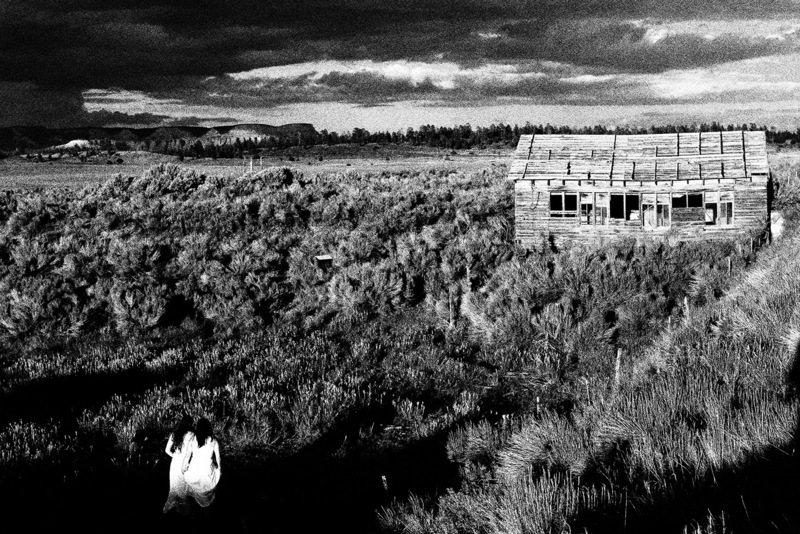 I’m not quite sure what’s going on in the album’s accompanying photography – although I’m sure whatever it is doesn’t bring glad tidings for nearby lands and villages – but it put me in mind of The Inner Scar (or La cicatrice intérieure), the 1972 film directed by Philippe Garrel, written by and starring both him and Nico (previously of The Velvet Underground). Which brings me back to my hipster point and is it always an actual jibe. Just as that earlier mentioned gathering could be considered the hipster kids of freak folk, The Velvet Underground and some of the associated Andy Warhol / Factory characters and personalities could also possibly be considered hipsters of their time. Anyways, Trans-Love Energies itself is a rather fine album that seems to play with a number of rock’n’roll / experimental music myths, iconography and archetypes; in parts it is electronic dance music but by way of Throbbing Gristle’s Hot On The Heels Of Love (indeed one track is called Coum, I assume in reference to Coum Transmissions from which TG sprung); song like, non-song acid house that has tumbled through the wormhole… Your Loft My Acid (Fearless Transhouse Mix Long) is Donna Summer via the other side of that wormhole and transmissions. A particular highlight for my good self is Witch Dance, which has a woozy, narcotic, almost narcoleptic feel that quite frankly makes my hair stand on end as each time I listen to it and causes me to stare and tumble into its all enveloping hold. Fine work. Tip of the hat to Mr Fearless and all concerned. Visit Death In Vegas’ home in the ether here. Tumble into Witch Dance here. 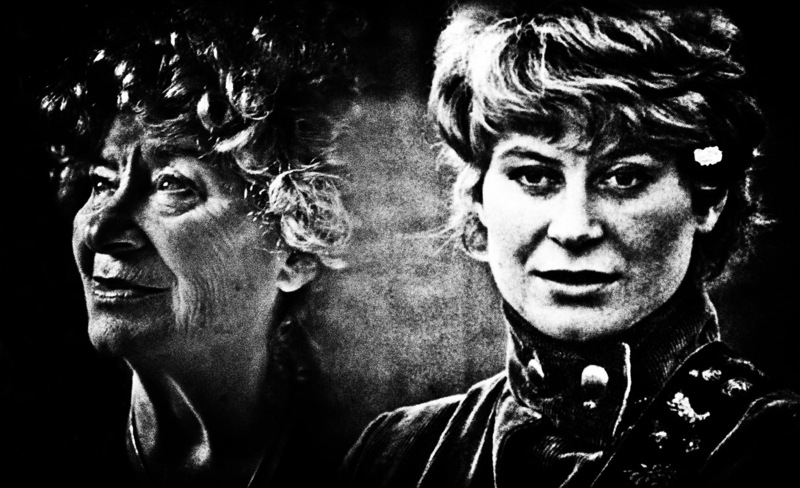 Well, I recently came across a post by Nick Abrahams where he talked about Shirley Collins, her work and the video he has made for Death And The Lady, one of the songs from her new album. When I watched the video, what it made me think of was Johnny Cash’s Hurt video – it seemed to deal with similar subjects and themes, of dignity, a particular view of an iconic figure and mortality. I was wary of talking about mortality and that connection to Johnny Cash but Shirley Collins herself says of the video that it “…captures the sinister quality of the song, the inevitability of death coming to us all…”. Although, when I first watched it I hadn’t yet read that and what they seemed almost to have tumbled from was an unsettling children’s television program from back when that you can’t quite put your finger on (the phrase hauntological would seem appropriate here). 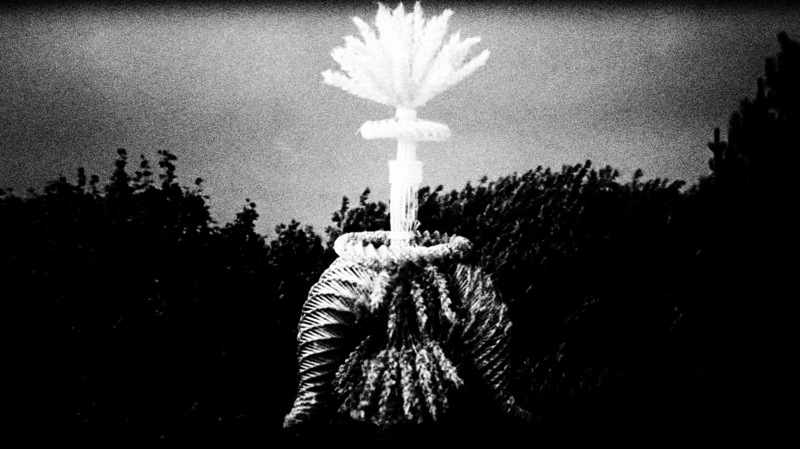 The video also features corn dollies from the Home Rites project by Cathy Ward and Eric Wright, which seem to be beautiful and entrancing, while also being unnerving in some manner that is hard to fully define. Peruse their home in the ether here and around these parts accompanied by faded foundlings here. 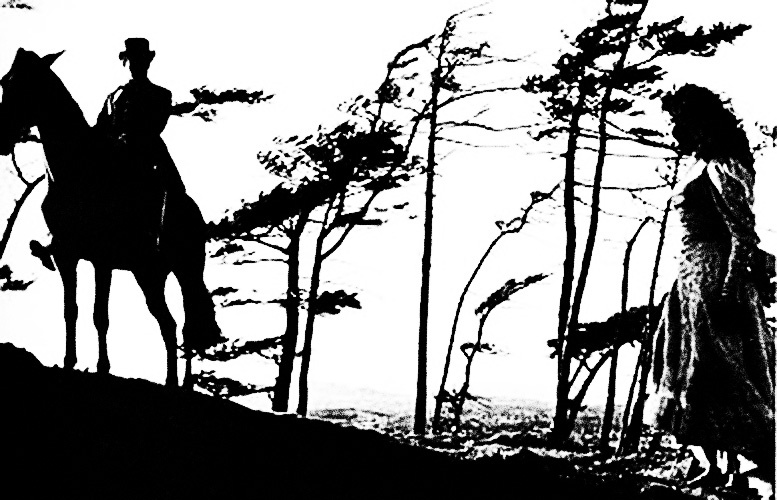 View the video, it’s hooden horses and Nick Abrahams accompanying notes here. And finally, you may know by the time of reading this but Shirley Collins first newly released record for 38 years is to arrive soon. Peruse that / Ms Collins’ home in the ether here. I was recently sorting out and re-ordering the piles of less corporeal, zeros and ones MP3 stores of music that had begun to gather digital dust around these parts over the years, when I accidentally came across Midnight Movies. Something of a (re)find indeed. The single I came across was Persimmon Tree from 2004 (b/w Just To Play). I have no idea how I found their work back when, although thinking of the year it was before quite such internet/streaming etc ubiquity of music and that it was either via the promotional items and discs that used to be sent to me when I was “spinning the platters that matter” once upon a time or possibly via the racks of such things that you could buy for pocket money prices in second hand shops. (CD singles and their promos. That takes me back. It’s a fair while since I saw a newly released CD single, let alone in a mainstream, high street shop as they once were or a row of used/sold-on promos that back when I seemed to spend a fair amount of time flipping through). How to describe Midnight Movies? Well, although having their own character, if you should appreciate the sort of avant-pop of the likes of Broadcast or Death And Vanilla, you may find much to enjoy here. 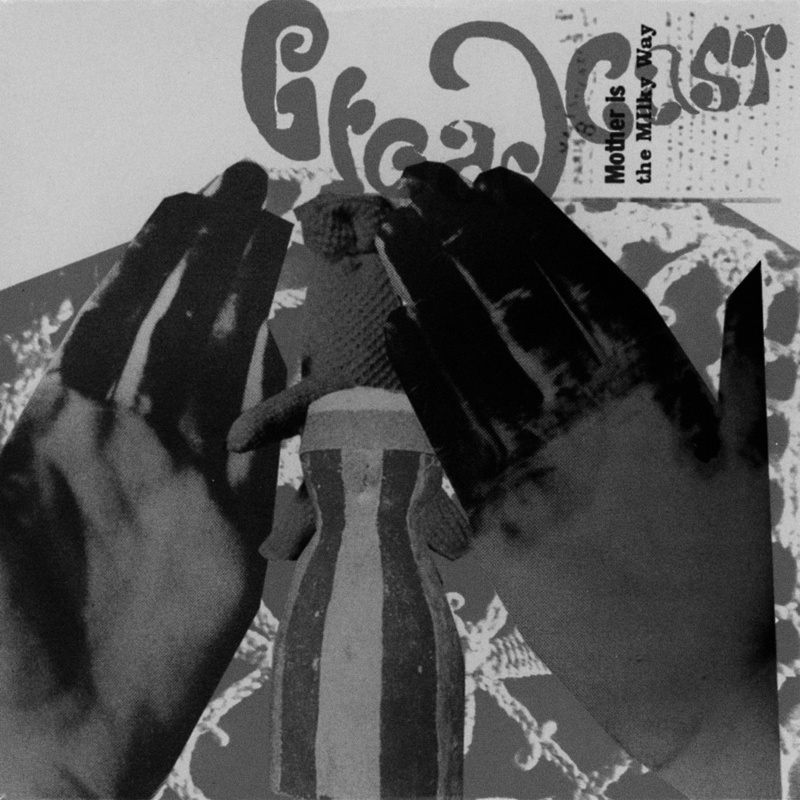 Melodic, accessibly experimental/exploratory and in some ways seeming to refer back to a previous hazily defined time or era, without being retro or a retreading (psych might be a good word to use around this point). A touch of Nico maybe, that icy aloofness or distance without being cold or unfeeling. The associated design work is very House-like, it is strongly stamped with his auteur-ist collaged design technique, which to quote myself “…often seems to make use of geometric shapes and patterns to invoke a particular kind of otherlyness, to allow a momentary stepping elsewhere…”. 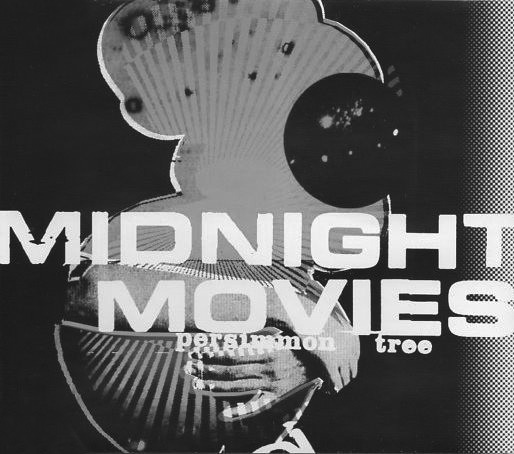 Mr House also created the artwork for the self-titled Midnight Movies album of around the same time (and looking at it probably the single Mirage), which also feature similar use of such elements/design. That crumbling, textured, Deborah Turbeville-esque style can also be found in some of the photographs of the band that appeared in the actual style press back when. Anyways, Midnight Movies and Just To Play – a rather pleasant (re)stumbling upon. Peruse the encasements of Midnight Movie here. Flickerings here. Further traces amongst the social ether here. Well, these were something of a treat to find. Now, as I may well have said around these parts before, once upon a time there weren’t necessarily all that many accompanying pieces of memorabilia and ephemera for films and TV. Which is in contrast to today where I expect you could well have a full time job keeping up with the output of such things for just one or two popular series or films. 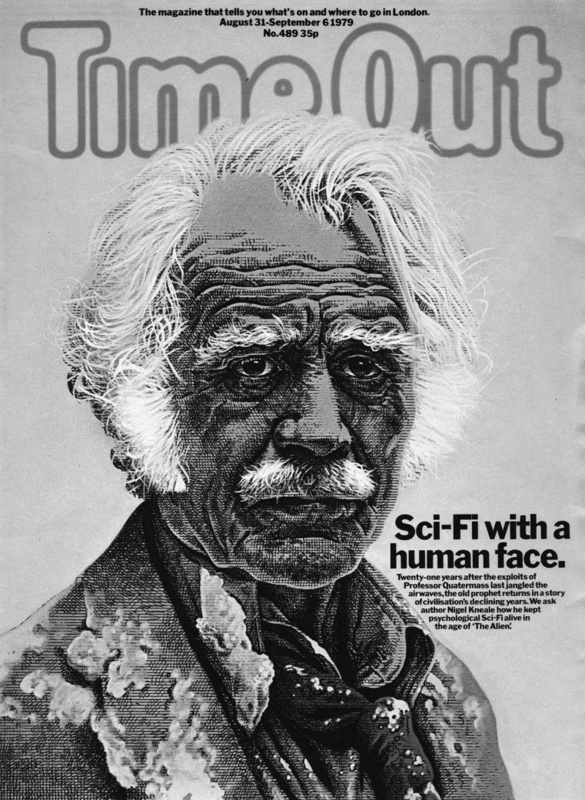 With that in mind, coming across anything related to the final 1979 Quatermass series feels like a very fine find as there’s something of a paucity of related items or printed artifacts from back when. Now, to my mind the above portrait / cover of Time Out should hang in national galleries. I find it beautiful and entrancing, ancient and modern – it captures the tired and world weary sense of Professor Quatermass in these later years paticularly well, with the subtle scan lines quietly adding to the whole thing just so. 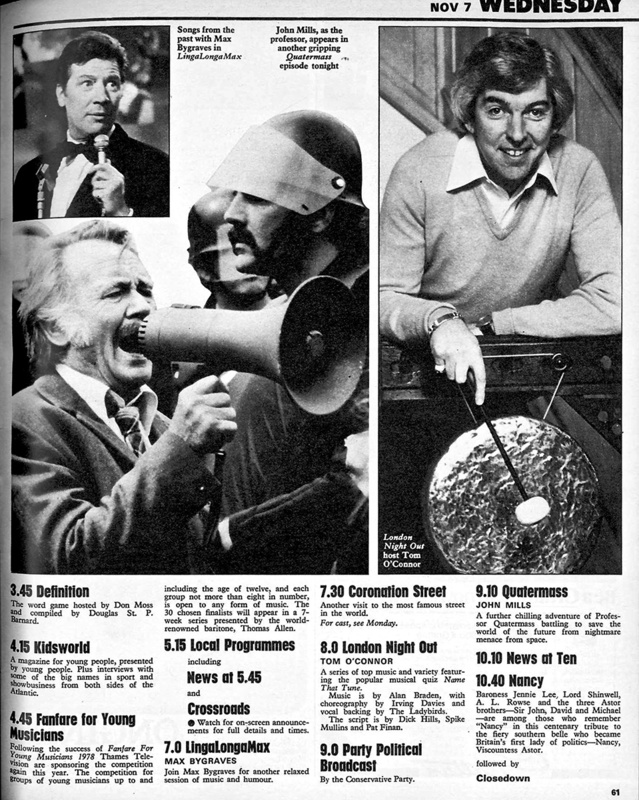 And then we get to the original schedule listings in the TV Times. I know that dystopic or threatening fiction / fantasy / science fiction can be quite a common thing among more overtly light entertainment but thinking of watching Quatermass after LingaLonging with Max Bygraves or Name-ing That Tune with Tom O’Connor seems just odd. 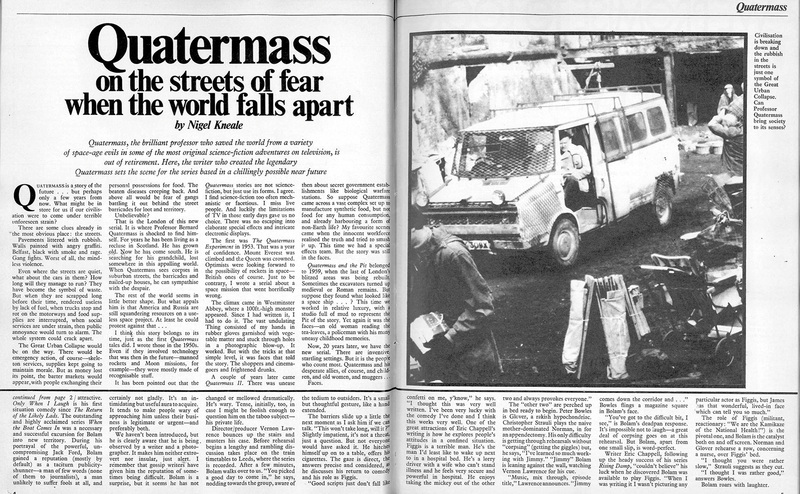 I suspect that’s in part because Mr Kneale’s work is more layered than much of similar more purely entertainment fare and also it’s hard to cast back and remove the subsequent weight of cultural, cult and hauntological associations of/with Quatermass and other tales written by him and to think of his work as mainstream, prime time broadcasts. 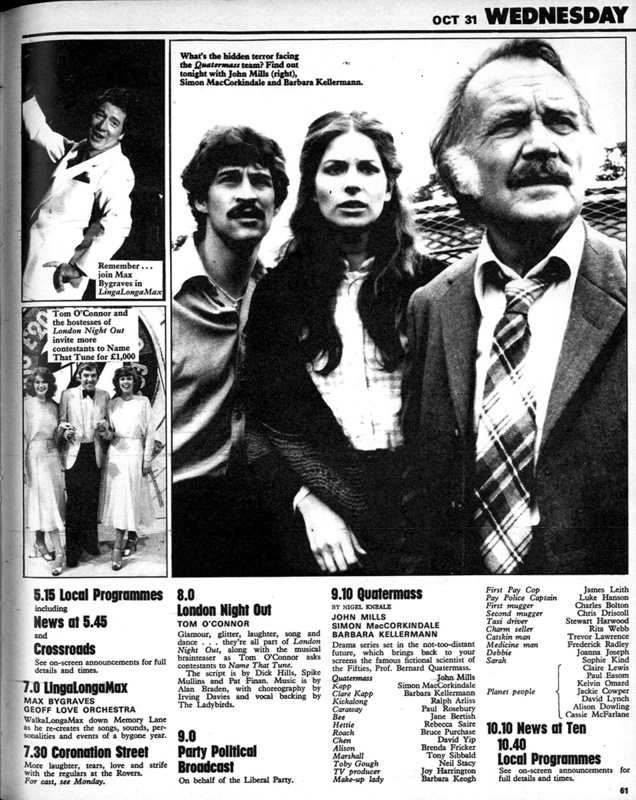 And finally, another TV Times clipping, where Mr Kneale talks about both this series and previous Quatermass outings. 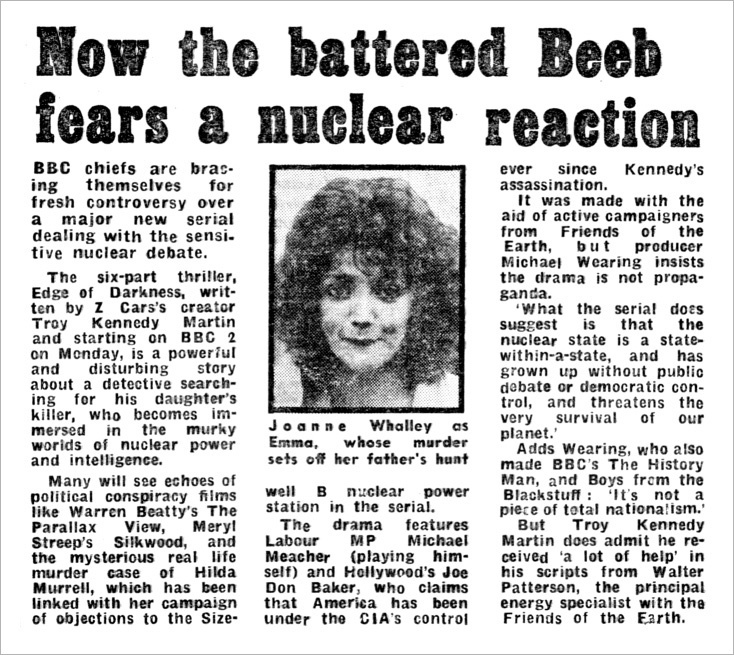 It’s interesting to hear from the horses mouth, as it were, the ways in which the various Quatermasses were connected to and intended to reflect their times, with the 1979 series being an extreme, possibly pessimistic, take and extrapolation on the then worries of a Britain which had been experiencing an extended period of social / political / economic malaise, strife and conflict. Which makes the Party Political Broadcasts just before Quatermass seem quite apposite and almost too perfectly placed; I can but imagine what the more, shall we say starboard leaning, broadcast was like and / or its themes; “It’s all gone to pot, vote for us or you’re all doomed!”. I came across the clippings courtesy of Mr Peter Fuller here and here, the Time Out cover via Mr Kim Newman here. Thanks and a tip of the hat to both. Quatermass has (relatively) recently had a brush and scrub up. Visit that here. Previous huff-ity puff-ity ringstone round wanderings around these parts can be visited here. Which I think is not a bad observation. And how did they get the money to do that? Well, I expect in part it was maybe because it was made during a peak of interest in all things youth and Swinging London, at a point when money was quite possibly being thrown at anything that might make inroads into the pockets and pounds of related younger folk… being directed by a gent who photographed one of The Beatles album covers may well also of helped. 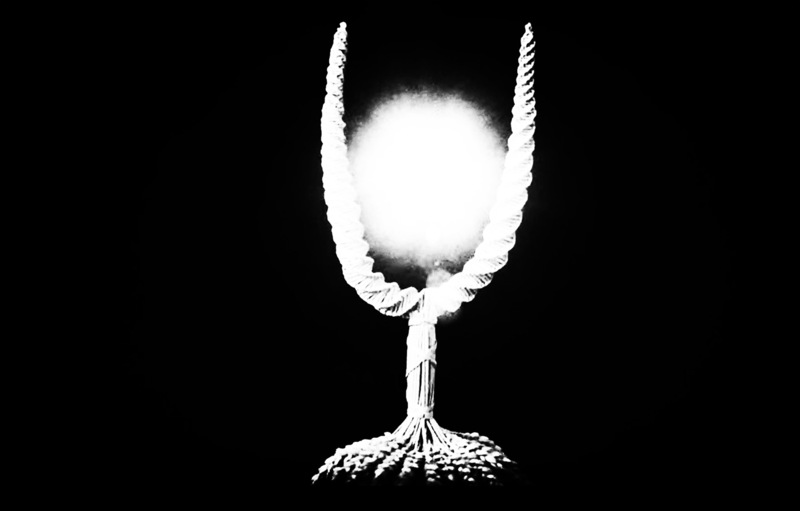 …or indeed to the science-fiction-psychedelia-in-the-country-experimentalism-created-with-a-reasonable-amount-of money that can be found in Zardoz. 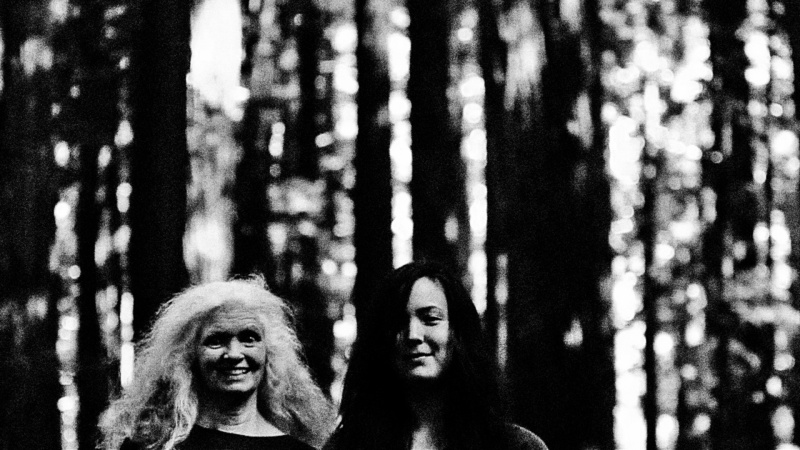 It also put me in mind of Queens Of Evil – where a group of stylish late 1960s women kidnap a pretty boy to live in their almost ginger-bread house in the forest – though that film has a decidedly darker psyche-folk-giallo air to it. …although it was a slight surprise to see that the screenplay had been penned by mainstream sitcom The Likely Lads co-creator Ian La Frenais. I like the way that there’s not even an attempt to explain how their bubble or lifestyle are afforded nor why anybody says anything about their quite frankly rather unusual giant blow-up see-through home that is sat in the middle of the countryside (complete with jukebox, canopied merry-go-round etc). If ever a film seemed custom made for say a BFI Flipside Bluray brush and scrub up it would be this one – in part I think that because at the moment the version/s wandering around have a colour palette where the hues seem quite muted and so I’m curious to see whether it was actually intended to be more a pop-art dazzle of colour, which would maybe suit the film more. Day #36/365: Psychedelic Folkloristic and niche corners of the electronic ether (which is more overtly folkloric than The Touchables pop-art pastoral playland in terms of takes on the late 1960s and related fashionable folk but they both interconnect). Peruse the trailer here (accompanied by the film’s rather fine theme tune – a fine piece of psych-pop by Nirvana. No, not that Nirvana. The rather more Shindig! friendly Nirvana). I think it’s a great shame that Broadcast’s Mother Is The Milky Way album (and I think of it as an album despite it’s possible EP or mini-album playing time) is probably one of the rarest of their artifacts and in fact is one of those relatively occasional items that seem to be genuinely rare in these days of general second hand ubiquity via the old ether. So, why do I think it’s a great shame? Well, it seems like the summation of a particular set of peaks and aims of Broadcasts work; a collection that gathers both their more pop and avant garde influences, mixing, matching and balancing both sides of such things in a way that somehow really quite off-centre jump cuts, lo-fidelity nuances, a certain dreamy surreality, dissonance, reversed and found sounds all seem very accessible. Using the description non-populist pop or avant-pop would seem to be appropriate about now. It also seems to be a very personal, intimate record – some kind of insight into the actual lives of its makers (whether that is a real and/or imagined one). Fine work and here’s to it finding a more widespread release (if Mr Cargill should wish that) one day. Points of inspiration for this particular wandering: well the album itself (of course) and Mr Joseph Stannard’s interview excerpt transcription with Broadcast (something of an ongoing point of reference for all things A Year In The Country). Previous Broadcast and related wanderings around these parts: Day #33/365: Broadcast and the Focus Group Investigate Witch Cults of the Radio Age and the recalibrations of past cathode ray stories… (talking of ongoing reference points for all things A Year In The Country), via Shindig! 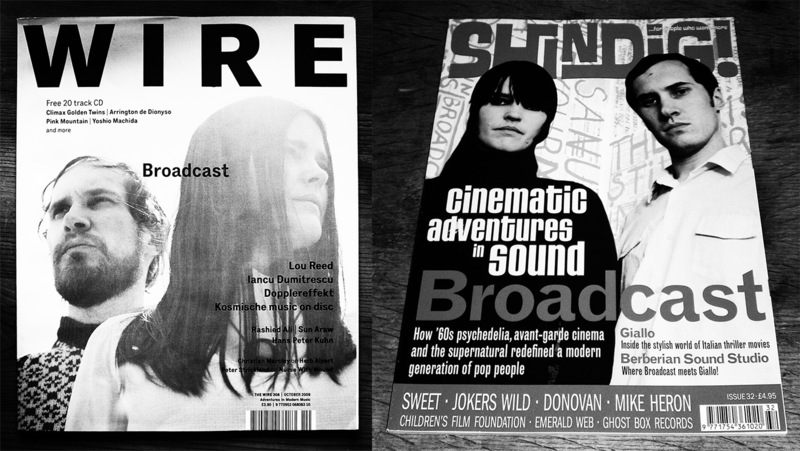 magazine at Day #178/365: The cuckoo in the nest: sitting down with a cup of cha, a slice of toast, Broadcast, Emerald Web, Ghost Box Records and other fellow Shindig travellers… and Day #251/365: Broadcast; constellators and artifacts. 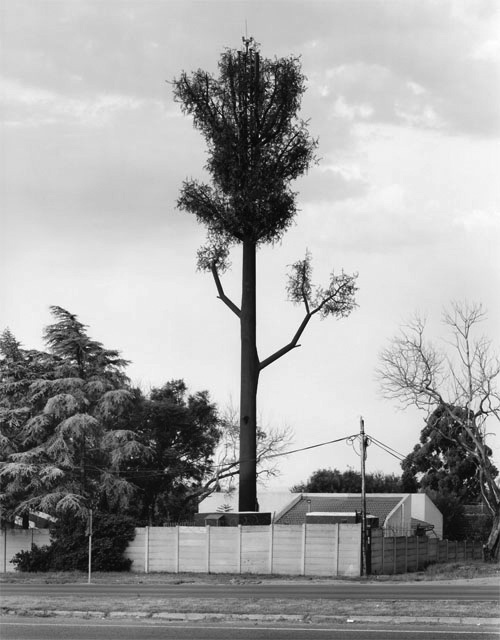 I first came across a particular new simulacra species of trees via Aperture magazine and an article on Robert Voit’s New Trees project. 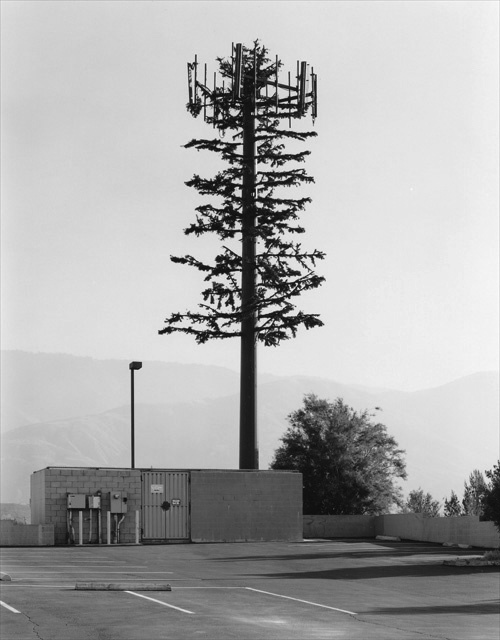 Mr Voit has spent a number of years using GPS tracking to hone in on mobile phone masts disguised as trees (and sometimes cactuses). They’re peculiar things. Sometimes with the aid of distance in the photographs they can seem quite convincing, although I expect they’re not especially so close up. And sometimes quite a bit of design effort seems to have gone into creating a vaguely reasonable facsimile of a tree, whereas at other times they make me think of the military training houses built in the deserted / requisitioned village Imber that the authors of Uncommonly British Days Out described as being like childrens’ drawings of a house (see Week #18/52). Or actually, what I first thought when I was revisiting them was they looked like the trees built by a future dictatorship that seemed to have taken its design cues from 1980s apocalyptic video-shop science fiction. A wander around the ether at more of such things also shows how rather than create a whole tree like structure, often it is more as though the masts are peeking out and intertwined amongst them. They also made me wander about at what point does utilitarian pretty-ing up of things become art? I don’t know. I suppose in part it is more in intent than actualisation. 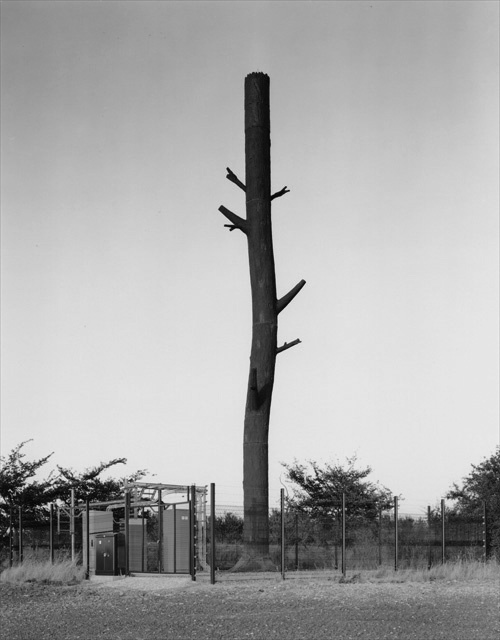 With that in mind, I think it would be fair to file such arboreal simulacra phone masts under accidental utilitarian art – alongside say some telegraph poles, pylons, other broadcast masts, Soviet bus stops and possibly library music. Mr Voit’s work can be found here. 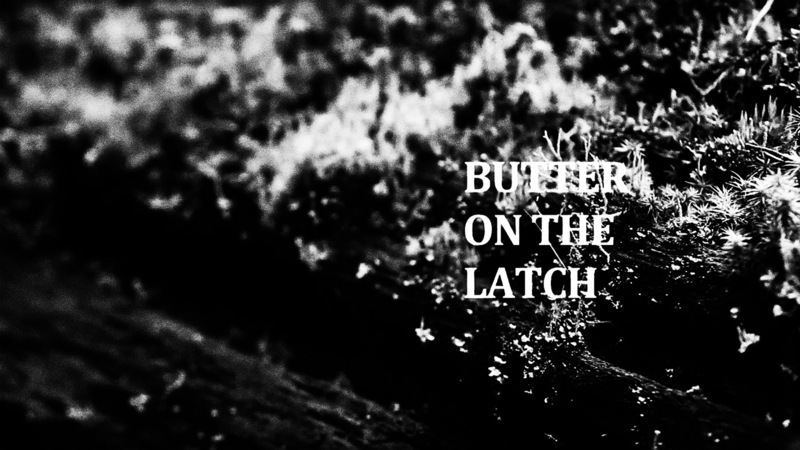 Now, I’m not quite sure where I know of Butter On The Latch from but I know that I saw it written about in the venerable BFI’s Sight & Sound magazine, under the headline “Dark Pastoral” and with the above photograph with “Lovely, dark and deep” written below it. Interest piqued, as they say. Well, let’s put it this way, I expect that anybody buying/borrowing this from the ether and expecting mainstream fare in any sense may be more than a little disappointed. 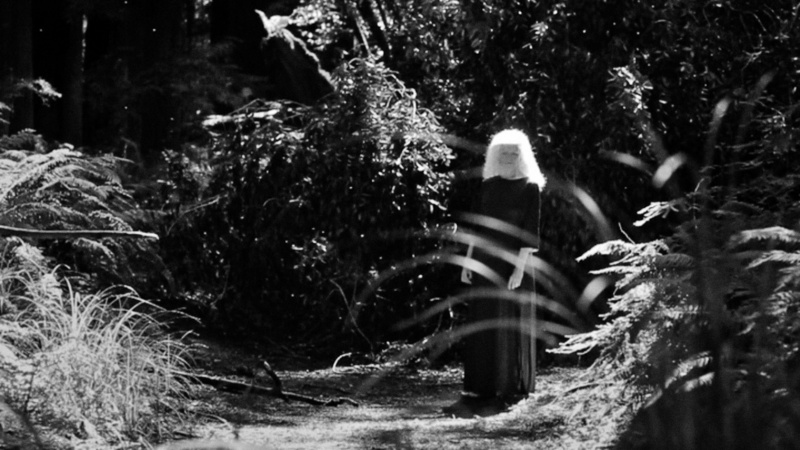 If pushed (really quite hard), it could be called a slasher in the woods but without the slashing – and all the more disturbing for it (a note on such could well be sent back in time to the likes of Symptoms, Queens Of Evil and Suspira / much of what has come to be known as giallo cinema). Through many hours of watching, your mind can become programmed to expect cinema to travel down certain routes, particular actions to follow particular setups. Although the film may follow some of those expected cinematic routes, it is not presented in a manner that could be closely associated with standard cinematic expectations. 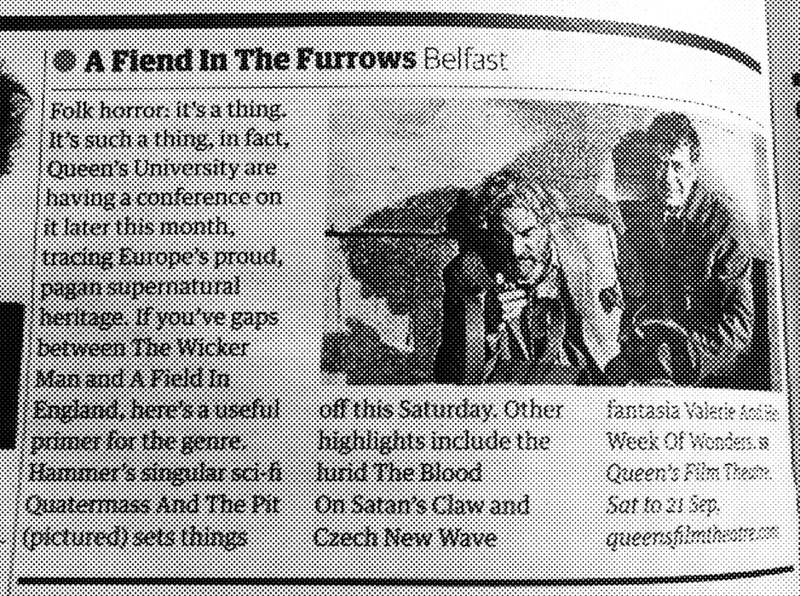 In a way I suppose it could be called folk horror and if you take folk to mean as being from the wild woods then that might well suit. These are woods that seem both tamed and untamed, connected to civilisation and yet those within it seem to have also crumbled away from it. In terms of aesthetics, the phrase cinéma vérité comes to mind, in the sense of it being made without frills or technically advanced artifice and although it is a fictional film, it is set in an actual folk life center, with what seem like non-actor participants / performers (which made me wander what the “civilian” cast members thought of the film when they saw it). 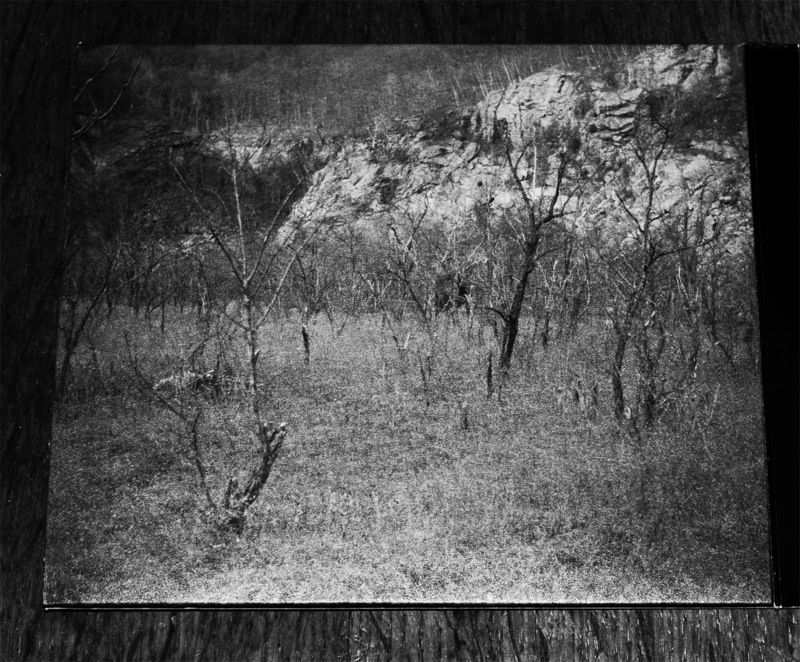 The hand-held documentary feel is complimented or should that be fractured by surreal flashes of staring faces in the woods and other intriguing, hypnotic, yet terribly unsettling images and sounds, often with a more overtly folk-horror / horror aspect; such split second moments, even if you pause or try to watch the film frame by frame are hard to quite fathom, explain or take in. 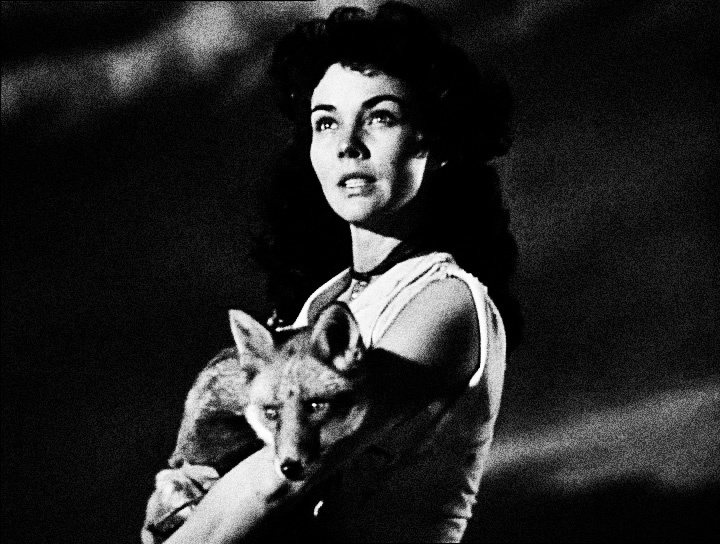 Often today films are lauded as / for being independent cinema but essentially they are still quite conventional with maybe just a few quirks or less corporate funding (which is not meant as a criticism, more merely an observation). Anyways. Butter On The Latch. Brrr. Even just writing about it I feel like a a good comforting cup of tea and a walk (at the side but not in) the woods to calm the nerves might be appropriate. View the trailer here. Visit it at Josephine Decker’s home in the ether here. 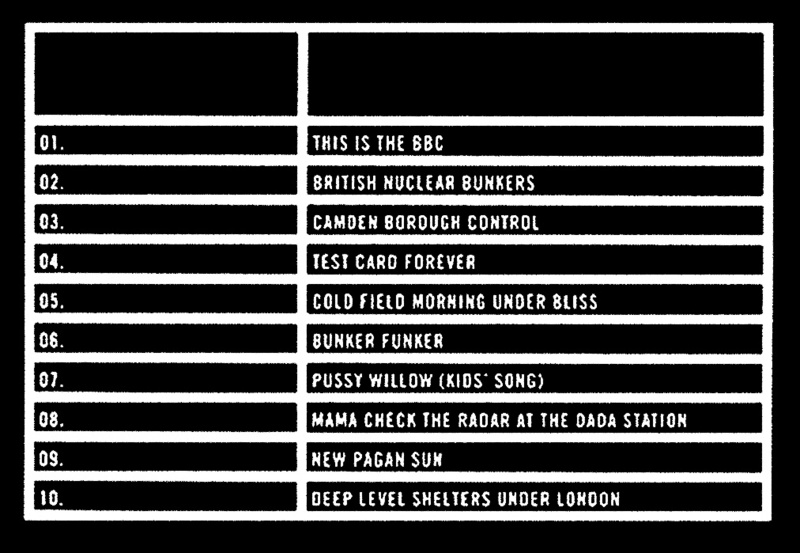 I was rather pleased to come across the documentary The School Is Full Of Noises documentary on the venerable British Broadcasting Corporation’s Radio 4 website. Around these parts we have visited certain aspects of experimental music work that have sprung forth from / been created for schools from years back (more of which in a mo’) and so it was nice to wander back to such things. I think one of the main things I took away from the program was the sense that the educators who used / employed / experimented with such techniques seemed to do so in part to get away from a particular view of making music that focuses largely on learning “proper” instruments and music “properly” and the associated exclusion that comes with that. 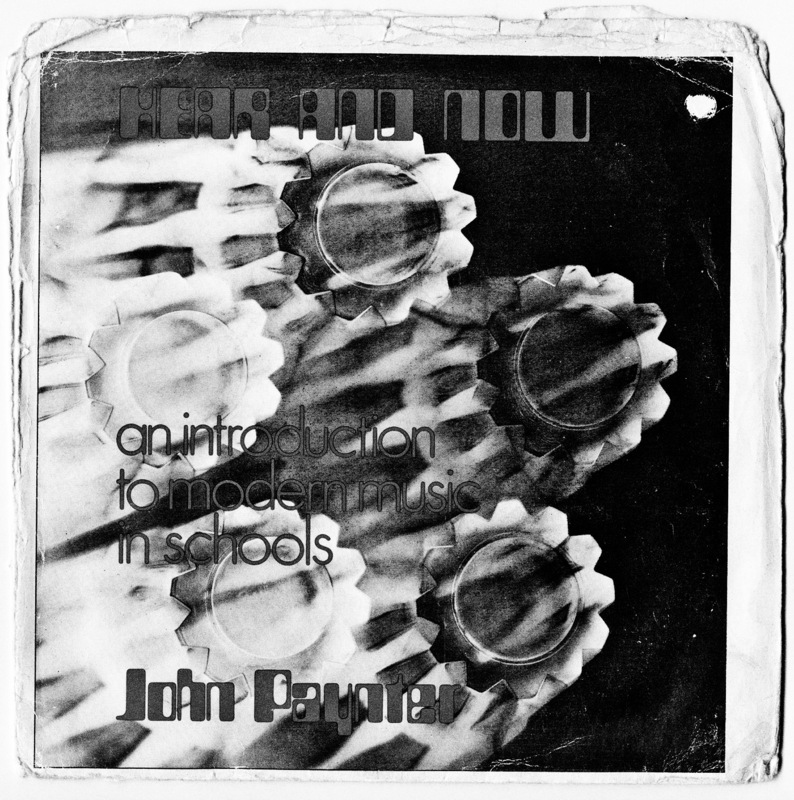 …I say not unsurprisingly as he has released several albums that collect music related to such avant-garde / experimental music that was created / made for use in schools. …the first of those albums that lead me towards such things and was an early(ish) point of discovery for A Year In The Country was David Cain’s / Ronald Duncan’s The Seasons album which Trunk Records releases, which I can hear in my head as I type and sounds as though it should also be the soundtrack to some semi-forgotten probably animated children’s television show from back when that has quietly become or revealed itself as being a little unnerving over time. Anyways, the documentary is well worth a visit and listen. Peruse it here. Visit the work of Mr David Cain and related others around these parts here. Visit Mr Jonny Trunk on that and related work here, here and here. The documentary focuses in particular on the work of John Paynter. You can peruse a fine selection of imagery and considerations related to his work at Toys and Techniques here, here, here, and here and at A Sound Awareness here. At the moment there seems to be a romantic nostalgia for certain elements of older technology, particularly in relation to music – whether connected to creation and recording and / or related physical objects; of appreciating / returning to a certain level of awkwardness and inconvenience to things – sometimes in actuality, sometimes more as an idea or mixed and matched with contemporary zeros and ones techniques and distribution. Connected to the above, I suppose could be the relatively recent fanatical upswing in modern day shellac musical encasings and a love of all things analogue. More of such things another time maybe. 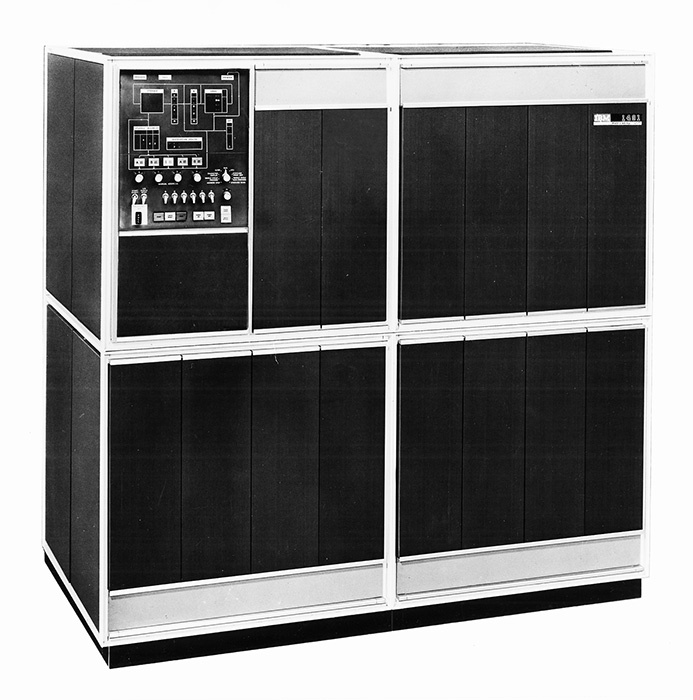 Recently, in rather unexpected surroundings I came across an album called IBM 1401, A User’s Manual by Jóhann Jóhannsson. 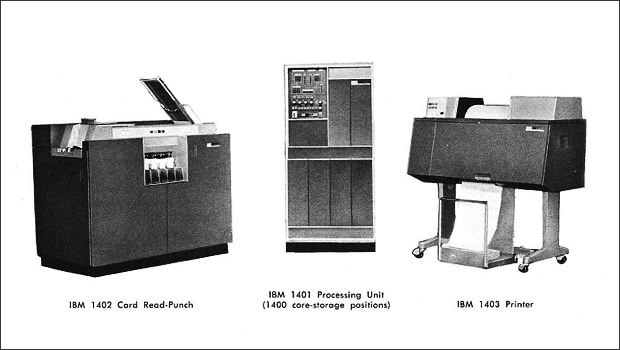 The IBM 1401 was a computer that was produced from 1959 until 1971 – which seems like a rather long stretch for digital technology in these rather brisk times – and were intended as a replacement for unit record equipment which processed things on punched cards (and more of those such things another time maybe), being a more new fangled tape drive based machine. 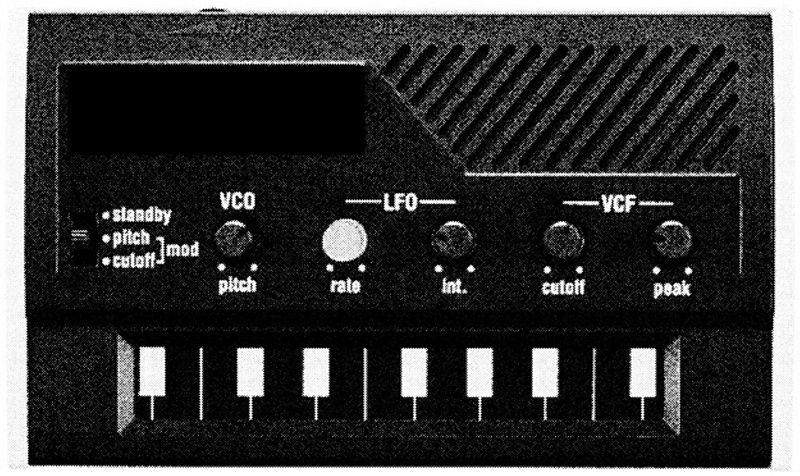 Anyways (again), Mr Jóhannsson’s father was a maintenance engineer on such 1401’s and he programmed their memory so that electromagnetic waves could be picked up by a radio receiver that sat on top of the computer and created music via this technique. 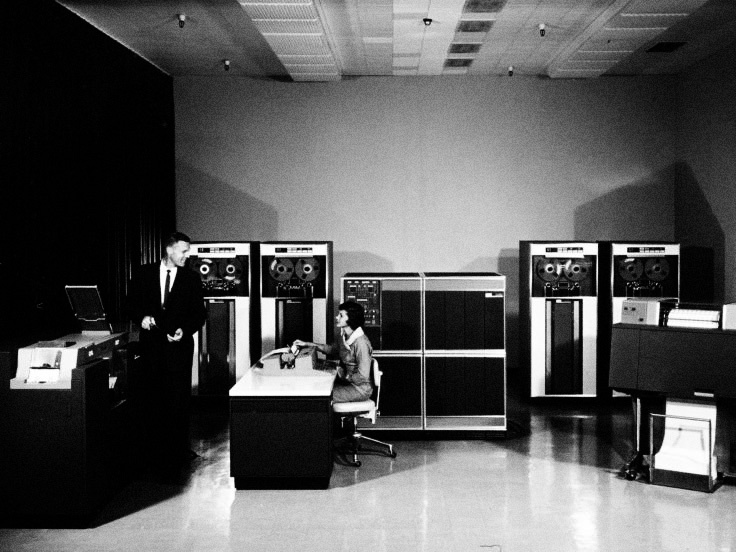 There’s a certain, well more than a certain, poignancy to the imagery this conjures up and the sense of affection for a set of computer workhorses that this gent had kept ticking along. Not a million miles away, in its own way, from tales of those in the countryside who kept workhorses essentially as pets on working farms after their superseding by friends with four wheels rather than four legs. 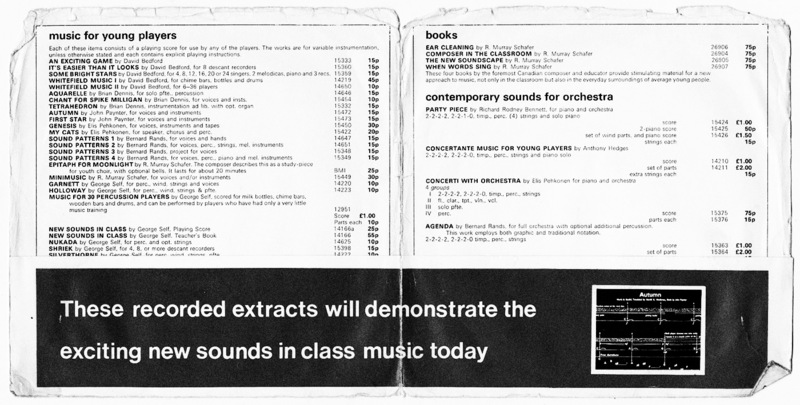 Anyways (again again) much later after this earlier bidding farewell, Jóhann Jóhannsson found the tapes and created his own elegy to an elegy – hence IBM 1401, A User’s Manual. When I first discovered about this album, I was fascinated by it, the story of it, the story of the tapes and how they were made, the visions, sounds and images it conjured in my mind. 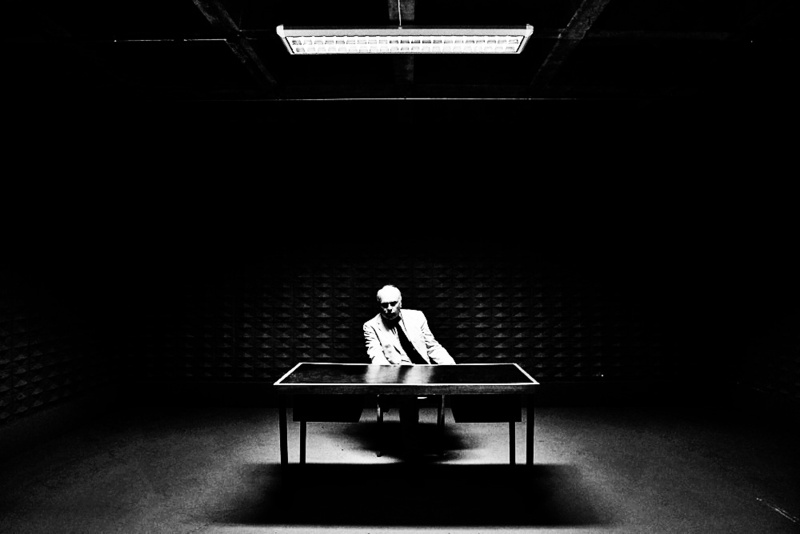 So, through the easy and ubiquity of the ether based opposite of the earlier mentioned awkwardness, within moments I started to listen to the album. It was interesting hearing the music Mr Jóhannsson had created as it doesn’t take the Radiophonic-esque bleeps, whirs, crackles and whistles of earlier technology route that might be more immediately expected, rather this is a much more almost classical, elegaic body of work that layers the original recordings and excerpts from maintenance instructions. Those instructions, particularly in Part Two: IBM 1403 Printer seem to belong more to say those you would find for a mechanical engine than something we now connect with computers – notes on keeping oils topped up and ball bearing maintenance for instance; reflections of a world, time, place and ways that now seem far, far removed from our own. A modern day User’s Manual here. Notes on it’s wellspring here and here. 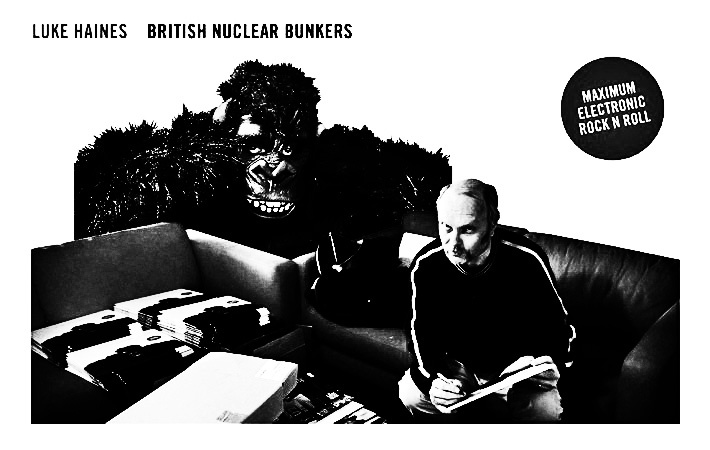 Mr Luke Haines has been called “our most non-hauntological hauntologist” and one of his recent(ish) album releases seems to but add credence to that description (or should that be title?). 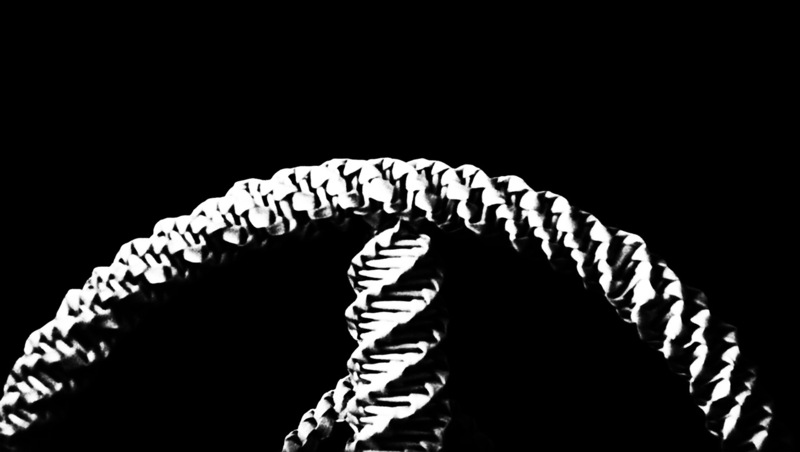 Hidden patterns in TV idents and related ephemera? Cold war dread? If one checks the information found in previous case law I think one will find it all points to one particular thing and (non)genre. …and well, without looking into it further I think that’s what he’s done. …and in the spirit of such things, beyond a sentence or two said as an almost aside about his possible future use of those tuppence ha’penny audio-electrical-oscillating devices when discussing a rock and roll cookery book (of all things) that he’d been working on and a brief perusal of an album accompanying video I have let the (possible) myth of the whole album being recorded on such things intact for myself. Peruse Mr Haines talking about such pocket money audio creation devices and related work here. His home in the ether and for this particular (non-hauntological) hauntological delving here. Talking of non-populist work in a populist framework (see here)… Edge Of Darkness, 1985. When I recently re(rere? rerere?) watched this, a comment by Dennis Potter – by way of Mark Fisher – seemed to become somewhat stuck in my mind, about how successful the “occupying forces of neo-liberalism” had been, in reference to changing and controlling the landscape, freedoms and concerns of mainstream television / culture. 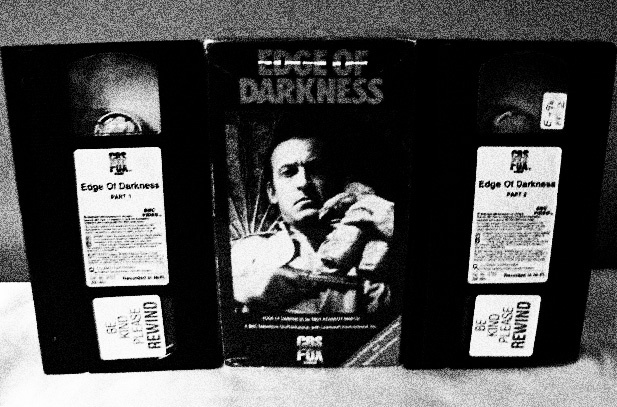 Now, I can enjoy work that is purely intended to be entertainment or escapism, no problems with that but I find Edge Of Darkness particularly interesting as it shows that exploratory, nuanced, layered, politically engaged television can be just as entertaining as more purely escapist work. Also, that it can be just as popular with viewers and with critics (4 and then 8 million viewers on its first and then quickly repeated runs and 6 wins / 11 nominations at the BAFTAs). It puts the lie to the sense of the eighties as being a time purely of lightweight froth of a certain type or types and the omnipotent rise of a Milk Snatcher-esque view of the world. Edge Of Darkness, along with fellow companions such as The Singing Detective and The Monocled Mutineer from a similar time*, shows that era more as one that was sparking with rearguard actions against those “occupying forces“. The world it presents looks very real, lived in, almost dour at points and in pallette but also it is flaring with vivid dark undercurrents. In a way it shows a very sleazy world that the lead character Craven steps into – or maybe he had always been there but just in a more day-to-day, prosaic manner than this. 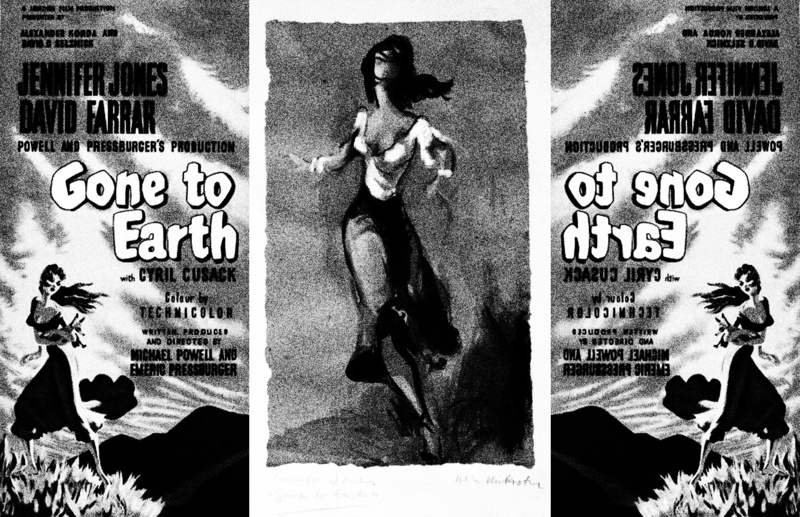 Although it has been described as an eco-thriller, I actually think it’s quite hard to strictly define it in terms of genre or to say precisely what its political stance is; there is a strong sense of it being anti a kind of nuclear despotism but this isn’t a didactic, hectoring piece. It is more work that is densely steeped in the ambiguities, corruption and shifting standpoints of that earlier mentioned vortex. It is also a very human, at time tender tale that takes in the love for and commitment to family. Decency is another word that comes to mind. And with decency in mind, in some ways it travels from a more conventional, almost noirish lone-wolf / knight in armour tale and descends into some form of madness, perhaps one which reflects the participants states of mind and the worlds in which they are stepping or working. An almost final scene where conspirators and those who battled against them are shown dining and quaffing together reminded me of the end of Animal Farm, where those who rose up can nolonger be told apart from those against who they rose. Squabbles seem to be put to one side during an almost hallucinatory hellish oligarchical meal. By the end of things, there is little sense of things having been resolved, although it is cathartic to a degree and leaves one with some kind of sense of hope. It also made me think of Sapphire and Steel; another example of non-populist work within a populist framework, wherein not everything is thoroughly explained, tidied and neatened up for its audience but wherein fairly visionary, unique tales are also rather entertaining and gripping television. And just as with Sapphire and Steel, by the end there is a sense of having been betrayed by your own side in some way or at least the landscape and chessboard within which you have been operating has been quietly reshuffled and reorganised behind the scenes in order to suit the needs of those within the hierarchy. 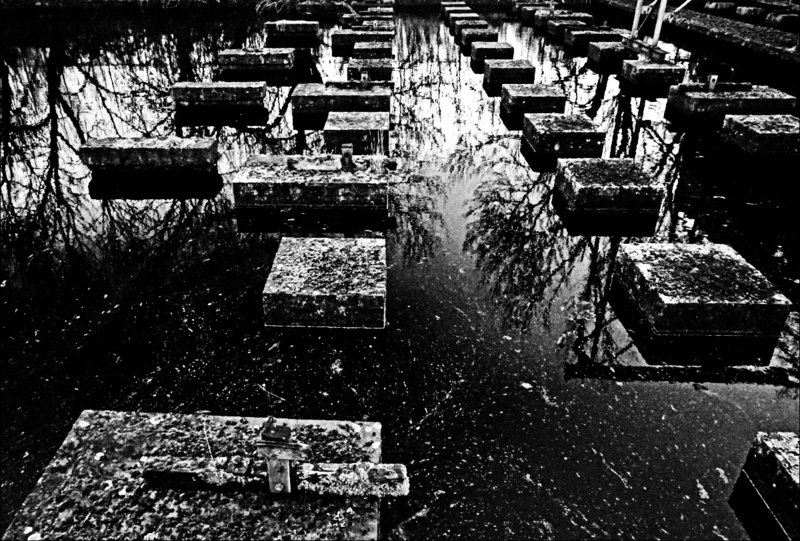 Peruse Edge Of Darkness further here and here. A home in the ether: one of those rare places in amongst the zeros and ones that you come across that have survived the mayfly-like spans of such things and which already seem to belong to another age entirely can be found here. 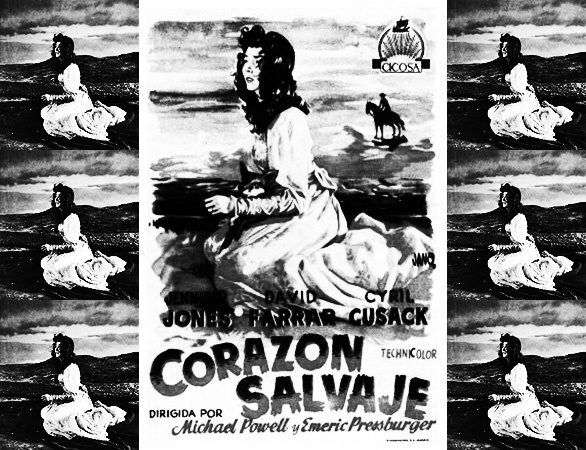 In some ways it is a caddish melodrama, with the untamed rural main female character marrying the local priest (the “good man”) but being lead astray by the almost moustache-curling-baddie wants and takings of the local squire. However, it is much more than that and as you watch it you can feel it straining at its period restrictions re sexuality, desire, faithfulness and respectability. It is a non-populist / exploratory work presented in a populist framework – often something of a favourite way of presenting things around these parts – and there is just something, well, odd about it that is hard to quite put your finger on. And it has a genuinely shocking, I expect particularly non-focus-grouped (! ), non-populist ending that just left me, well, shocked. In some ways the air of not-quite-real-ness makes it seem like the forerunner to the more fairy tale side of the Czech New Wave (in particular Valerie And Her Week Of Wonders and possibly Malá Morská Víla / The Little Mermaid) and also to the style, character and imagery of a younger Kate Bush, of a free spirit cast on, upon and amongst the moors. I’ve seen it said about Kate Bush that in her work she could be seen as channelling something ancient, which is something that seems to also apply to the Powel and Pressburger film Gone To Earth, it seems to somehow delve and dig deeply amongst the land and related archetypes; this is a tail where faiths old and new are part of and/or mingle amongst folkloric beliefs and practises. Hmmm. Writing about it all makes me want to wander back, watch and appreciate it once again. Most definitely a film that would appreciate a good old considerate, respectful, modern day Bluray brush and scrub up (I may well be looking hopefully in the general direction of Criterion here). Well, that caught the old attention somewhat and made me chuckle indeed. One of the aspects of that quote that caught my eye was that it made me anticipate a sense of fun or playfulness from the album. 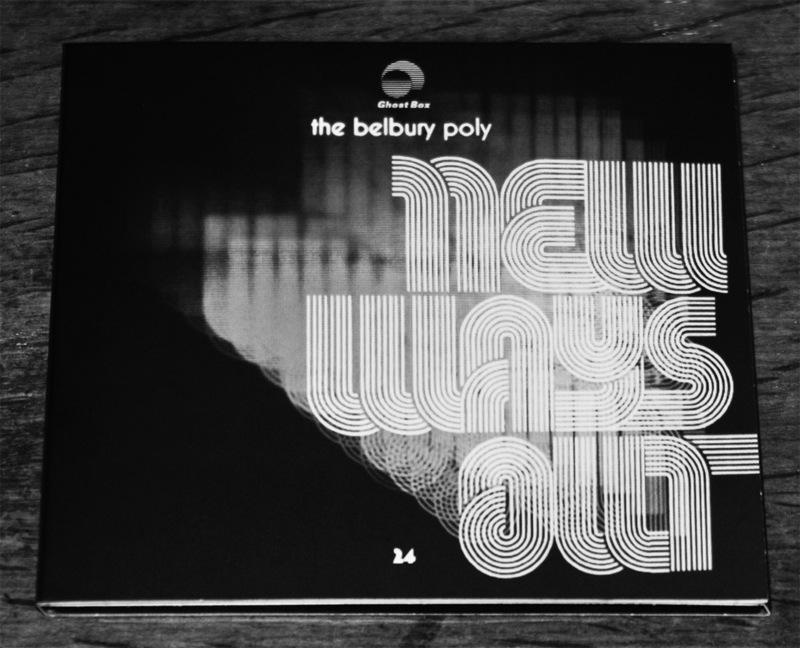 And indeed The New Ways Out has that via a set of rather catchy pop hooks, with that playfulness being quietly filtered through a Belbury Poly / Ghost Box view. …and 7″s of Playground Gateway would be piled up in Woolworths. (I find myself thinking The New Harmony should be on its own 12″ single release, in a time before such things became rarities and pretty much as expensive to buy as an LP. The songs length and epic-ness would seem to lend itself to such a format). In part, for me, the album seems to conjure up / refer to an imagined, indefinable golden age of synthesized exploration, one where such things were intertwined with the pop / mainstream music world and charts. This is experimental / explorative music but it’s such things not as a moody teenager in its bedroom with the curtains drawn, more one that has got itself down that Panda Pops disco and is having “a bit of a boogie”. …or maybe, if it was a particularly good week and just to show that the avant-garde / mainstream circuit was alive and functioning well, some early-ish work by Ms Kate Bush. A particular highlight of the album is The New Harmony – which seems to channel the aforementioned Kraftwerk, Donna Summers at her Moroder Peak and… well, who knows quite what? 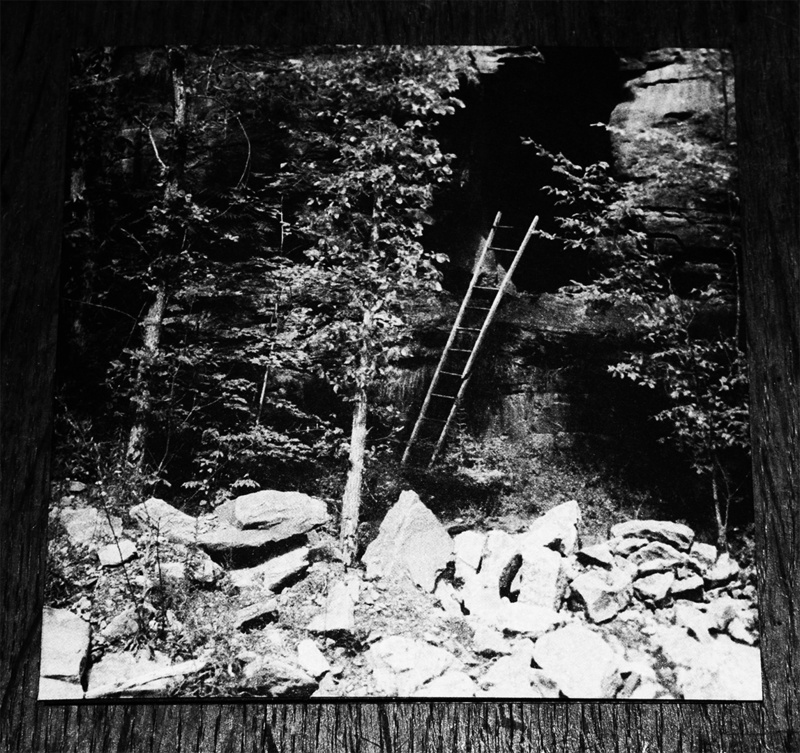 Which is one of the things with this album – often it reminds you of something but you don’t know quite what that something is, it’s just on the edge of memory. There is a sense of reference points and lines drawn from the past but without it being overly or overtly retro – it is more that it exists in a separate slipstream of its own. Anyway, back to The New Harmony. When I first heard this particular song, after a while I felt like I needed to look up to check that somehow it wasn’t playing on a seamless loop. It has a sort of endless, almost Kafka-esque quality (well, in a warm, synthesized Ghost Box manner), a sense of never leaving and it seems to make time lose traction. Playground Gateway ends the album and in that other slipstream world it begins as though it would be the second single off the album, starting with a knockabout schoolyard glam chant air before it wanders off to soundtrack science fiction explorations featuring gleaming golden crystal, floating cities that our hero approaches via a winged white horse. Meanwhile, Starhazy is the slightly more challenging third single that was played on late night radio, the devoted fans loved it (I can see the headlines now “Police called to break up pitched battle between Polyites and Numanoids”) and the audience on Top Of The Tops did their “not quite sure if I like this / if I should dance to this” that they often did for such things. It wouldn’t necessarily have been quite as big in the charts but would still have had gents at EMI etc popping champagne corks to a backdrop of one those upward travelling sticky taped sales charts. This particular vocal led song made me think of the likes of post-industrial bands such as Coil but without the sometimes portentous gloom and manner that can sometimes be found around those cultural parts. Hey Now Here He Comes is the album’s other glam-stomp (with a mild pastoral air) that the record company wanted as an A-side in the UK, but which due to scheduling and contractual problems only came out as a small quantity of 7″s in Belgium and many years later was rediscovered and featured on the second volume of the Velvet Tinmine. As always with the releases sent forth into the world from Ghost Box, the packaging and design adds an extra layer of complimentary, constellatory elements to consider and peruse. In this instance, the cover design of a cathode-ray trailed title / logo is lovingly crafted by Mr Julian House, as is often the traditional way with their releases but also inside is a fine piece of pen-smithery / illustration by Jim Jupp, the chap behind all things Belbury Poly. This has a gentle bucolic air while also somehow managing to convey just a slight atmosphere of off-centre-ness, for some reason that I can’t quite put my finger on and it seems to be both contemporary but also to have tumbled from a never-was but is out-there-somewhere children’s television show from back when. To begin to sum things up and coming back to that air of playfulness and the earlier moody teenager analogies, this is experimental, avant-garde, layered and culturally underpinned music that’s had a Babycham or two, learnt to kick it’s feet up, had a birrova laugh and maybe even scuffed a knee or elbow or two at morning break. Something of a breath of fresh air. Thankyou to Mr Jim Jupp and all concerned. Listen to and peruse New Ways Out here, in slightly newer, more fangled manner at one of Ghost Box’s ether victrolas here and amongst the notifications of The Belbury Parish Magazine here. Not so long ago I came across Danila Tkachenko’s Restricted Areas work and it somewhat haunted me. There is limited space on the shelves of A Year In The Country’s archival storage but this is a particular book which has been found a home there and I am rather glad it has as each time it catches my eye and mind, it causes me to briefly stop and wander. The photographs are of abandoned hardware, secret cities and installations from the Soviet Union during the Cold War period. 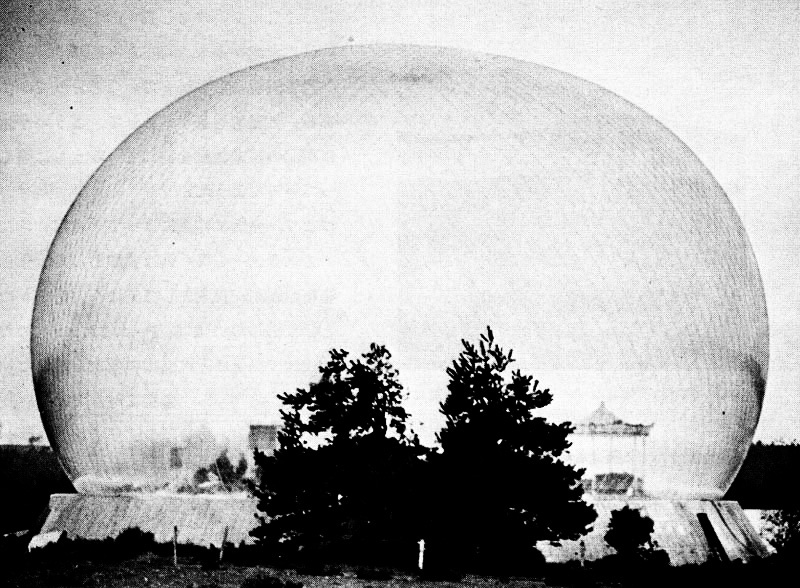 They include experimental laser systems, former party headquarters, antenna built for interplanetary connection with bases on other planets which were planned for once upon a time, a city where rocket engines were produced which was closed to outsiders until 1992, the world’s largest diesel submarine becalmed and landlocked, a former mining town which has now become a bombing trial field, a particularly striking amphibuous vertical take-off aeroplane built in a very limited edition of but two, space capsules left sadly alone and so forth. 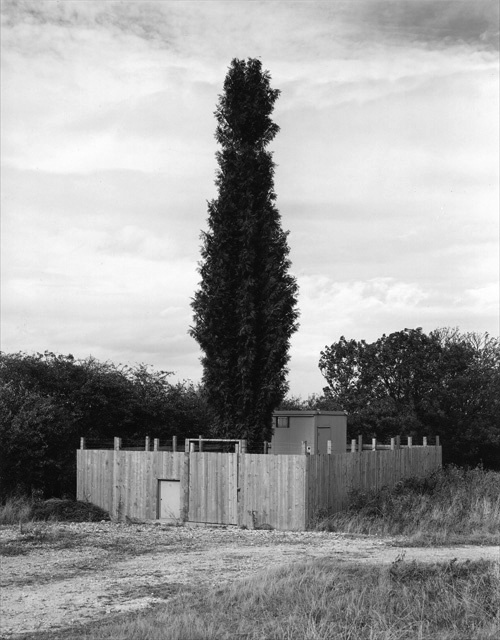 In many ways, the spirit of the photographs seem like a different time and places hauntology, a differing but also partly parallel strand to that which has come about in the UK / the West and its sense of an observation / mourning / yearning for a more utopian future which never came about. 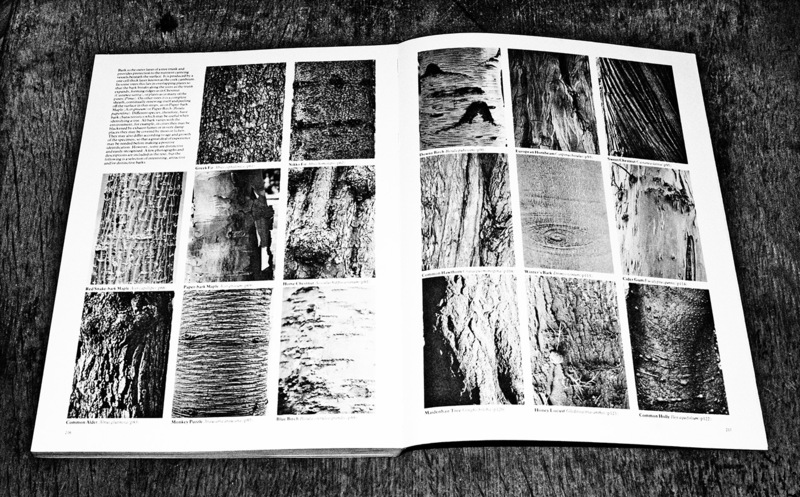 Interestingly, every photograph is of a snow covered / bound scene but this is not referred to anywhere in the text. 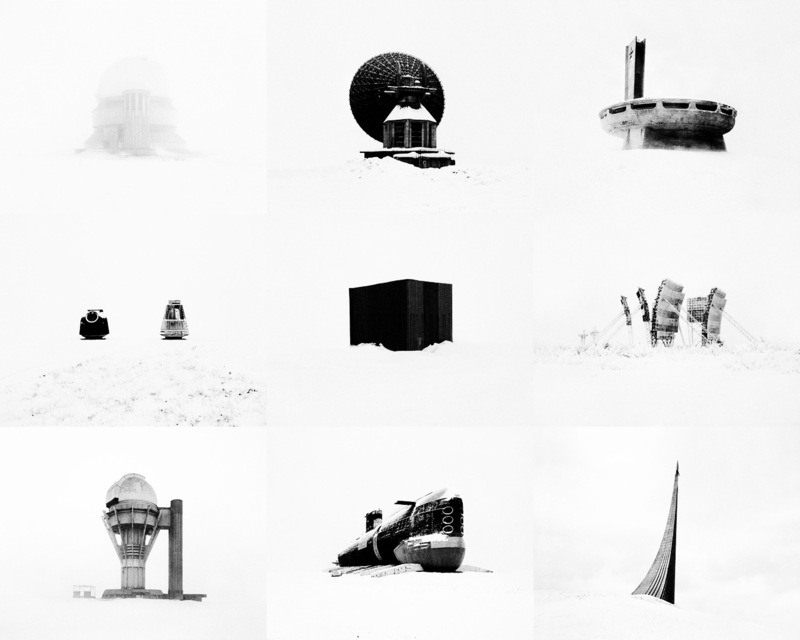 This lends a stark, isolated and also kind of naturally cleansed and beautiful, minimal aesthetic to these photographs of stilled monuments to a past and future that is no more. Looking at the images again now, there is a certain iconographic nature to them, their shapes, silhouettes and geometries seem inherently imbued with, to capture and distill a certain progressive, utopian, striving Soviet philosophy. Published by Dewi Lewis Publishing (something of a returning point of interest around these parts I tend to find), it is a particularly handsomely produced book; initially opening in an unusual tri-fold manner which reveals a map of the areas of this former empire, before progressing to accompanying text / imagery and which for some reason makes it feel like / me think of some lost cartographers document. I think one of the things that appeals is that there is a certain calmness to the book, which is I expect in no small part due to there actually being quite a small number of images contained therein, as opposed to an almost overwhelming, possibly jading deluge that is difficult to take in during one viewing / journeying through, as may sometimes be the case in larger volumes. 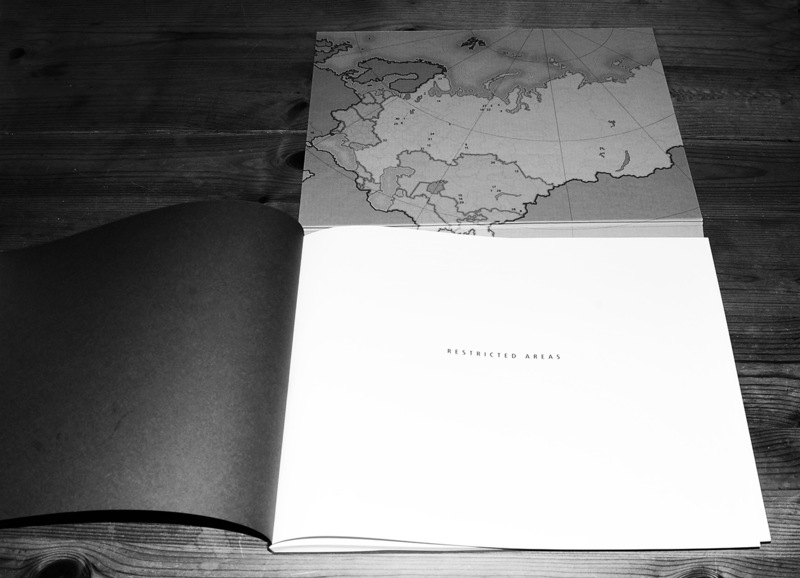 Although the work / book stands on its own as something of a unique document, it could also be seen to be part of a small but quietly growing library of Soviet ghosts, some of which I have visited around these parts before. These would include Jan Kempenaers Spomenik, which documents memorials from behind the once iron curtain, Christopher Herwig’s recording of the accidental utilitarian art of Soviet Bus Stops and the literally betitled Soviet Ghosts by Rebecca Litchfield, which is a Westerner’s view and wandering of often stately, still elegant Soviet Era abandoned buildings and infrastructure. 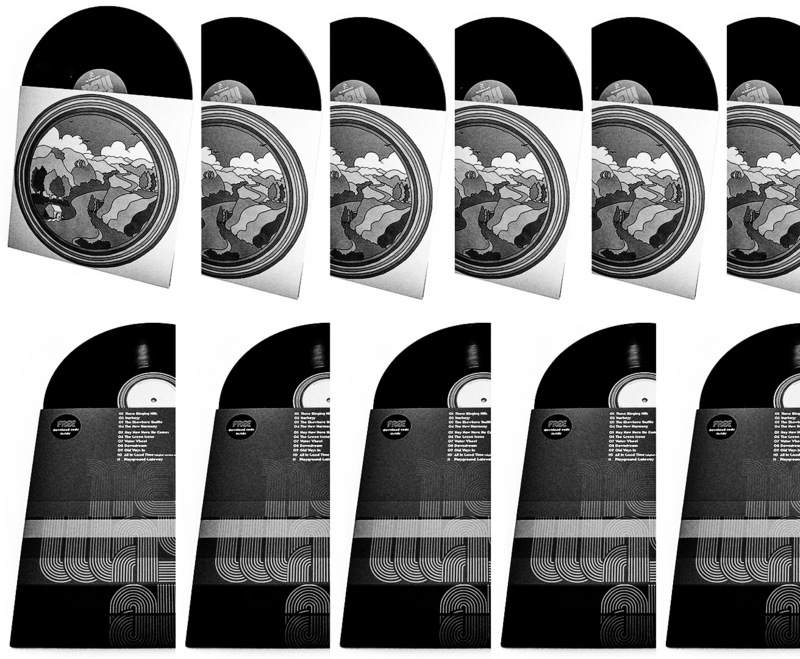 I could well also add Stephen Coate’s X-Ray Audio, which is a book which researches bootleg LPs that were produced in that previous era and utilised x-ray plates rather than vinyl / shellac. 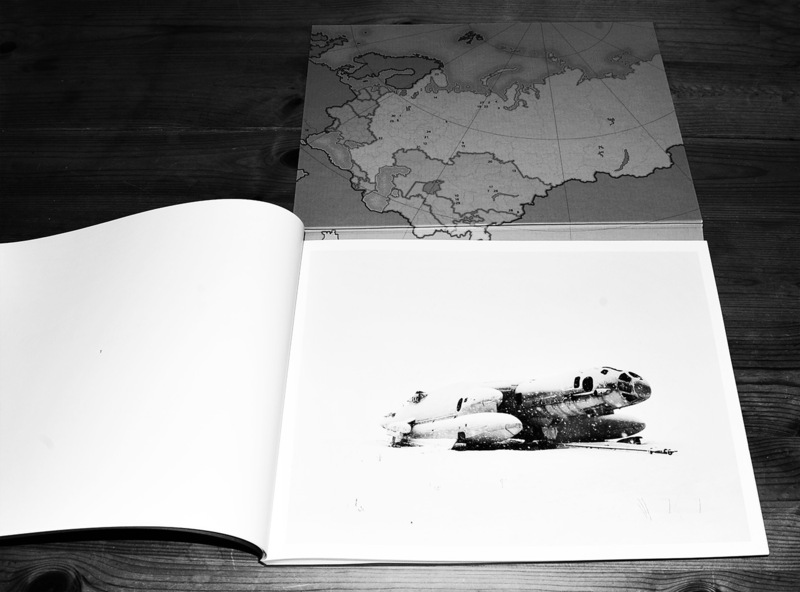 Visit Restricted Areas at Danila Tkachenko home in the ether here and at Dewi Lewis Publishing here. 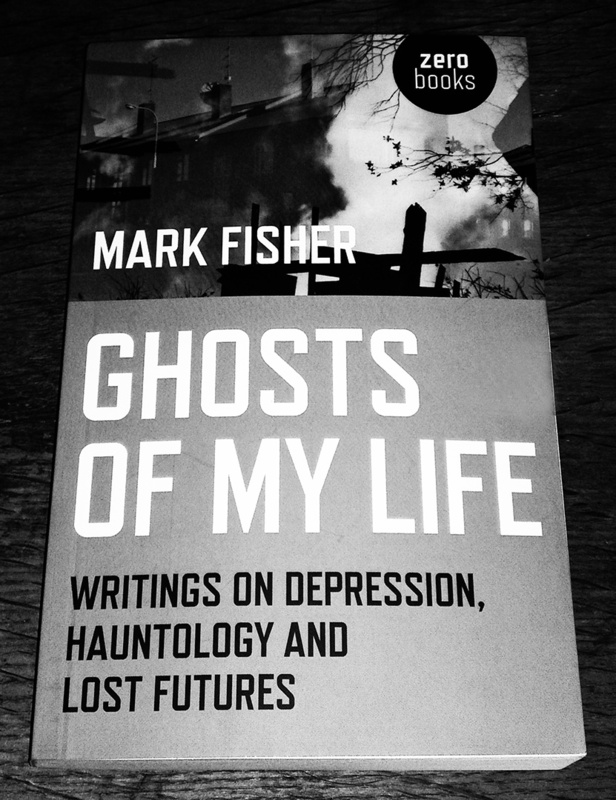 Find the other just mentioned bear’s ghosts elsewhere in the ether here, here, here and here.